Through scratched perspex, we looked down like giants on the rows of tiny buildings and straight roads that littered the flat valley base, carpeting the flat plain in dense, interlocking patterns. It all became toy-like, insignificant in the deep shadow of the high mountain massif. 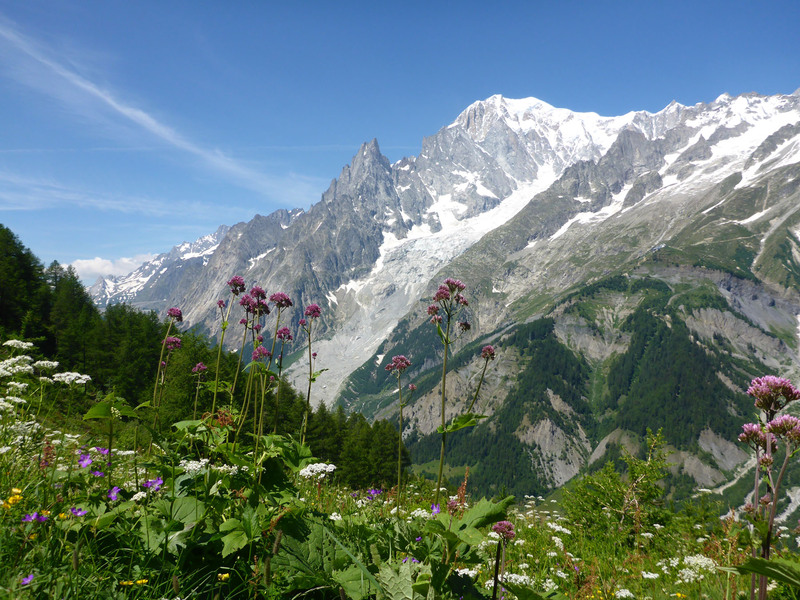 Opposite, we watched as the white domed cap of Mont Blanc came slowly into view as we rose higher in our gently-rocking cocoon. The famed peak would be the focal-point of our next ten days as we hiked a 170km oblong circuit around it, through three countries. We were both buzzing with anticipation. 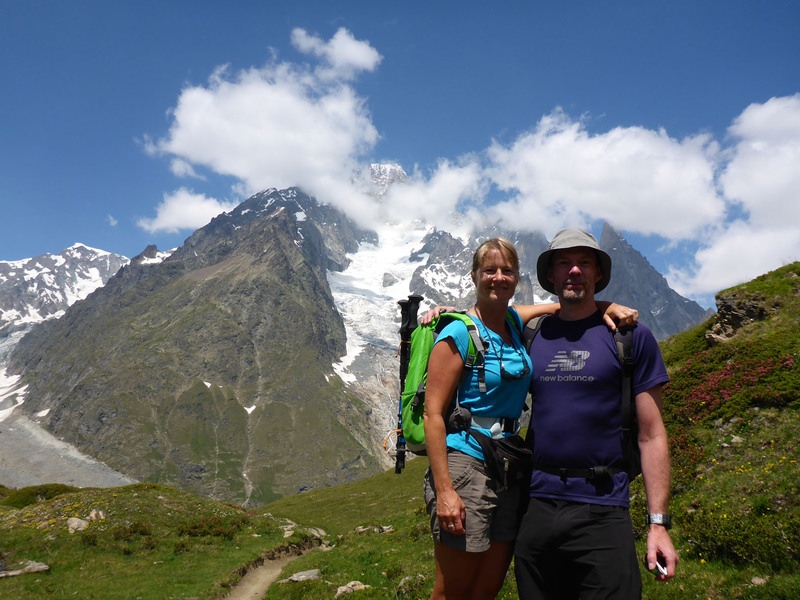 We arrived at the top of Plan Praz from Chamonix, France, to begin our trail. There were others here, colourful, noisy day-trippers, but we saw no one likely to be starting the hike alongside us. This was unsurprising, as we had chosen both an unconventional place to begin, and were walking the opposite direction to most. 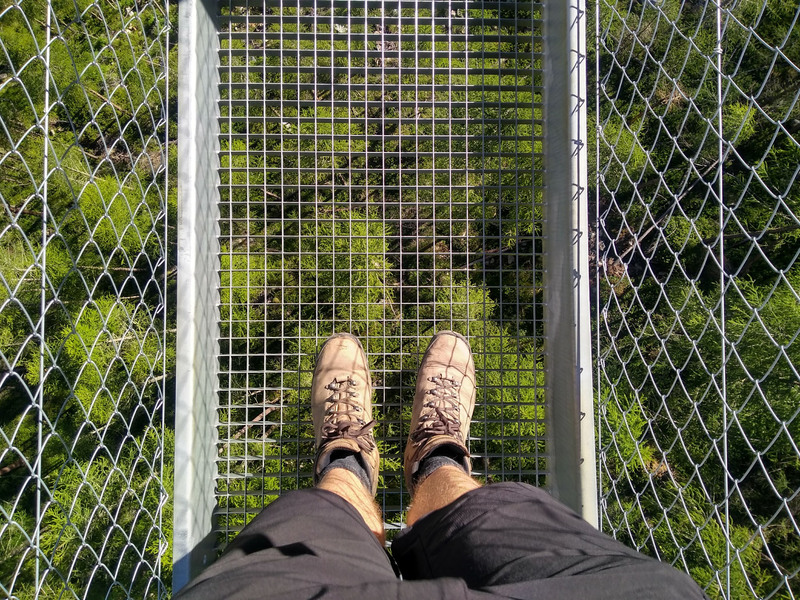 With a little trepidation, partnered with nervous excitement, we followed a dusty path of loose gravel up behind the lift station, gaining height with each forward step. 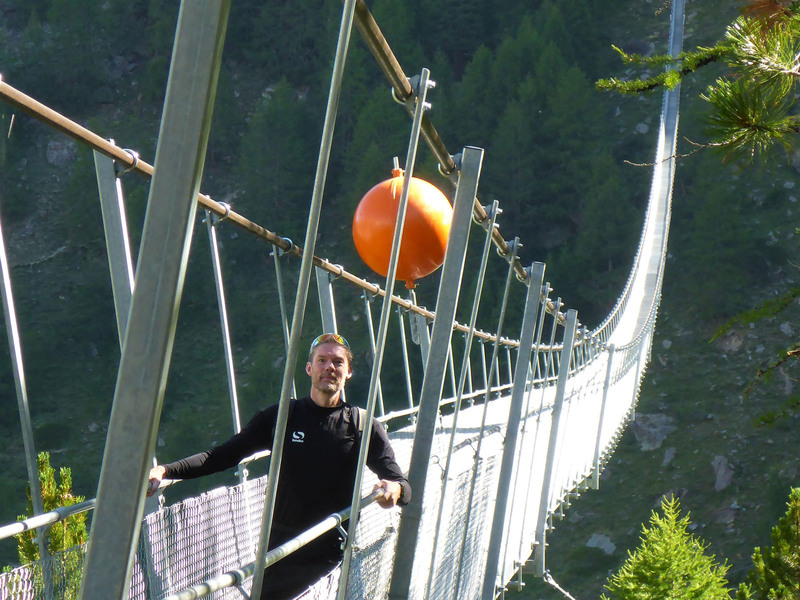 We felt alive, readied for the challenge, eager to get moving and to begin discovering the path ahead. We were soon engulfed by the tall sides of nearby mountains. Their dry faces towered above us in grey knuckles of coagulated rock. Smudges of pristine snow remained set in deep gullies and rubbed high on deeply shadowed slopes. Around them the earth smoothed to a shrub-speckled plain, and on all sides the horizon was closed-in by snowy peaks, pale in the distance. 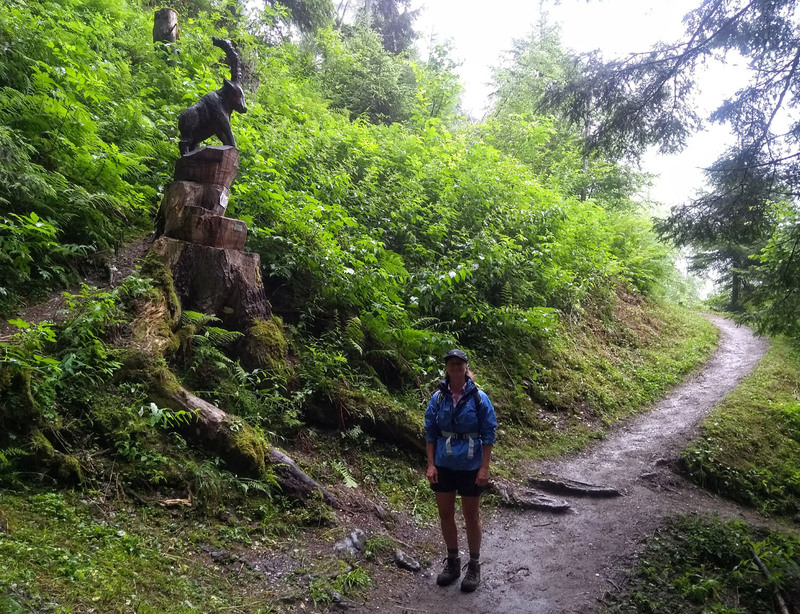 We traversed this stony face on a well-used trail, leading through pockets of vivid-green fir trees on narrow, dusty trails. Combined with the remaining blotches of greying snow this created a Christmas postcard feel, jarring in our imaginations with the muggy heat of the late morning air. In the next valley, deepened with heavy shadows, we could see dots of colour approaching, lined like caterpillars along the obvious snaking path. These were the groups of tradition-respecting anti-clockwise walkers we expected to meet each day. We nodded and smiled our way past them, glad for each spark of company but occasionally craving the clear and quiet solitude of an empty trail. With us walking clockwise, against convention and crowds, we experienced wonderfully alone mornings, full of welcome solitude. We could stumble and sweat up our morning climbs in peace, without witness. Around halfway through each day’s walking we began to meet others, usually on a downhill stretch, for us. We enjoyed these sociable afternoons, brimming with cheery greetings and occasional chats, as we silently, selfishly, revelled in the thought that we had completed the most difficult stretch of our day. All those we passed had still to face the climb we were now descending from. 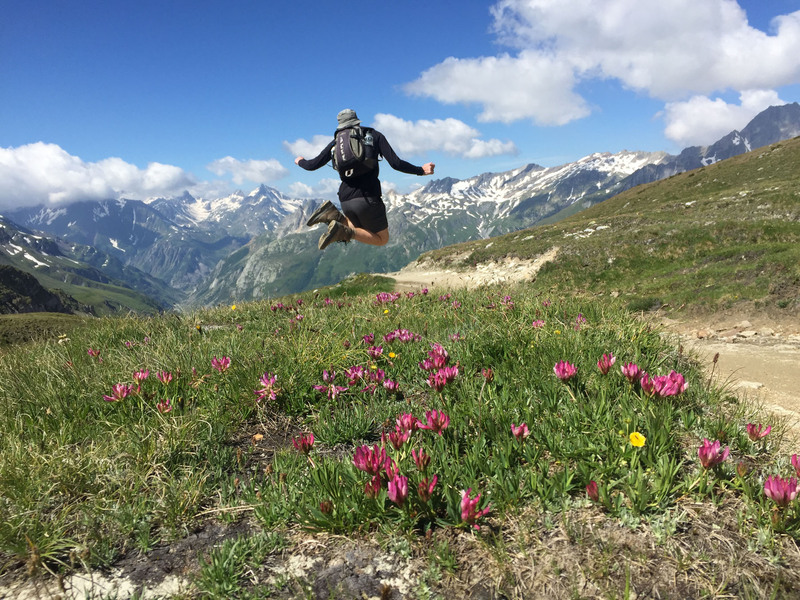 On occasion we jogged small stretches of downhill trails, slow in hiking boots, but it was much easier on our knees to fall with rather than fight against gravity. 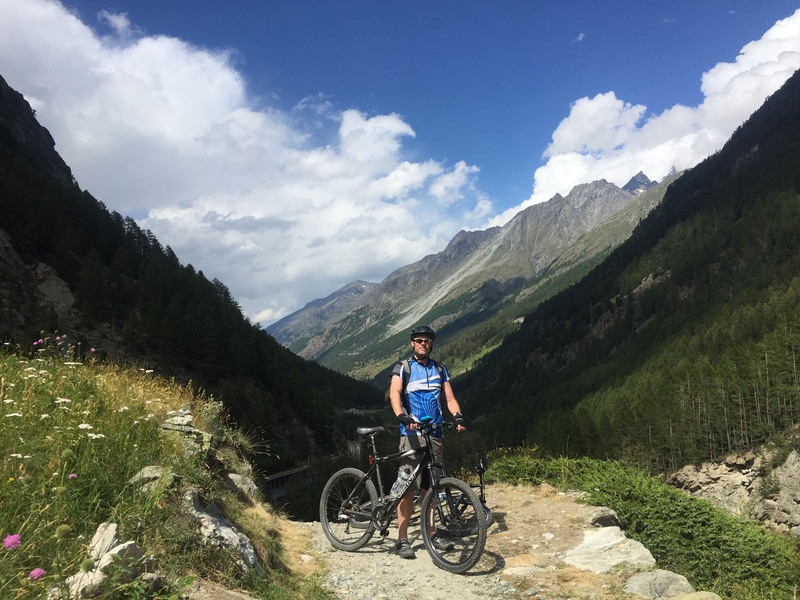 We were occasionally passed by committed cyclists on fat-tired bikes, belligerently forcing their way up the steep, rutted trails, or joyously falling fast down them. The circuit contained a continuous accessible beauty, and we never tired of the new vistas each section brought. 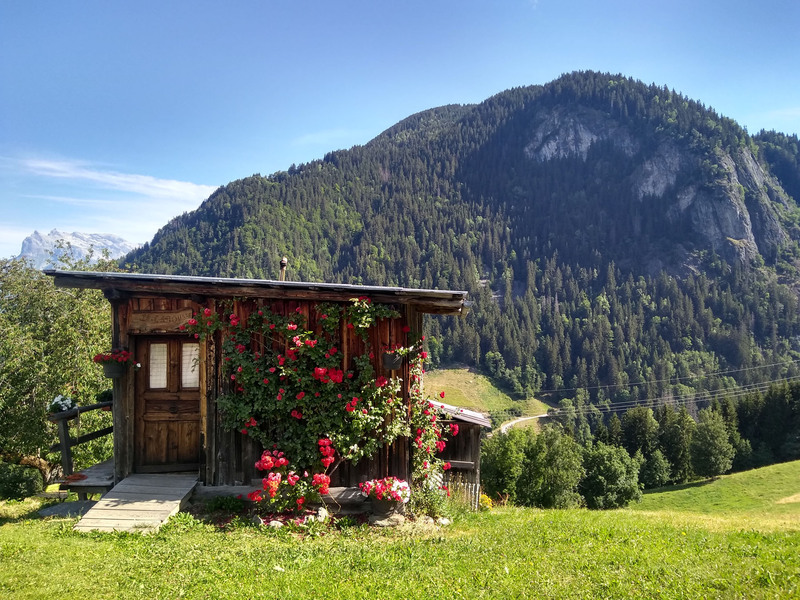 Flowering meadows crowded with bell-ringing golden cows, villages of perfect timber chalets decorated with climbing roses, and high mountain peaks topped with snowy domes, scarred with deeply-clawed gullies. Set above the treeline, in shaded crevices, we stared at the ragged tongues of rough-surfaced glaciers as they prodded menacingly towards the valley floor. At smaller scales, tiny alpine flowers brightened each path, their tiny star-blues and butter-yellows a reflection not of insignificance but robust hardiness. We longed for each upcoming change, to see what was next, just as we wished a favoured view could stay with us longer. Nothing was permanent, yet every change was valuable and worthy. 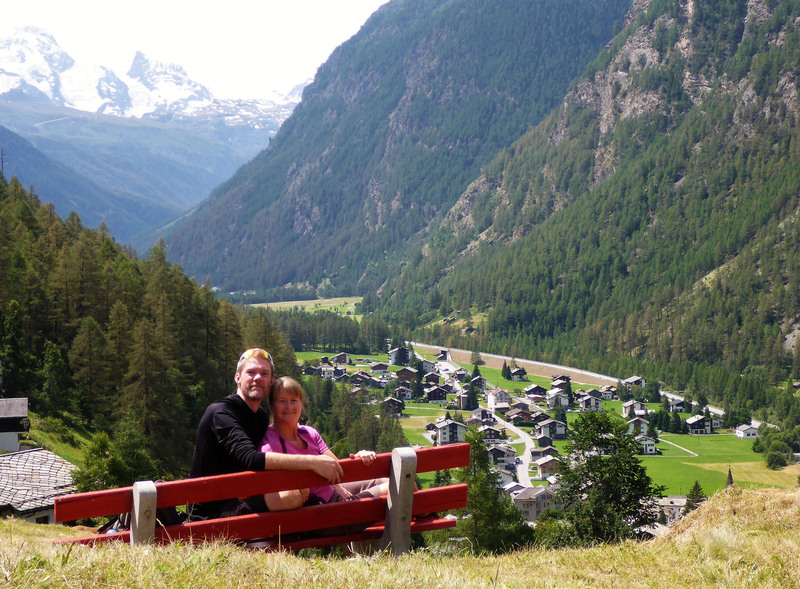 We soaked up all that we could, breathing in the views alongside the fresh, clean air of the high mountains. 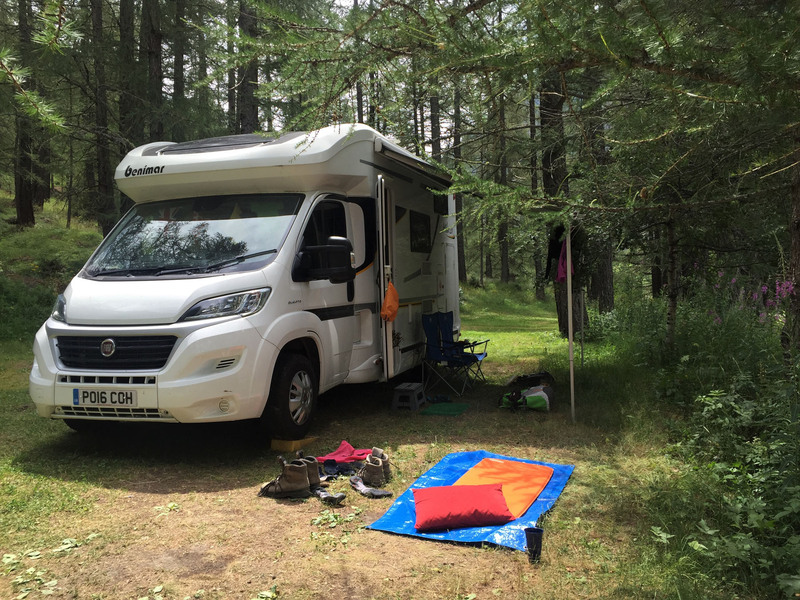 We saw this trip as a break from our normal van life, each night after walking a treat of long showers, clean sheets and prepared food, away from the usual daily chore of shopping, cooking and washing up. 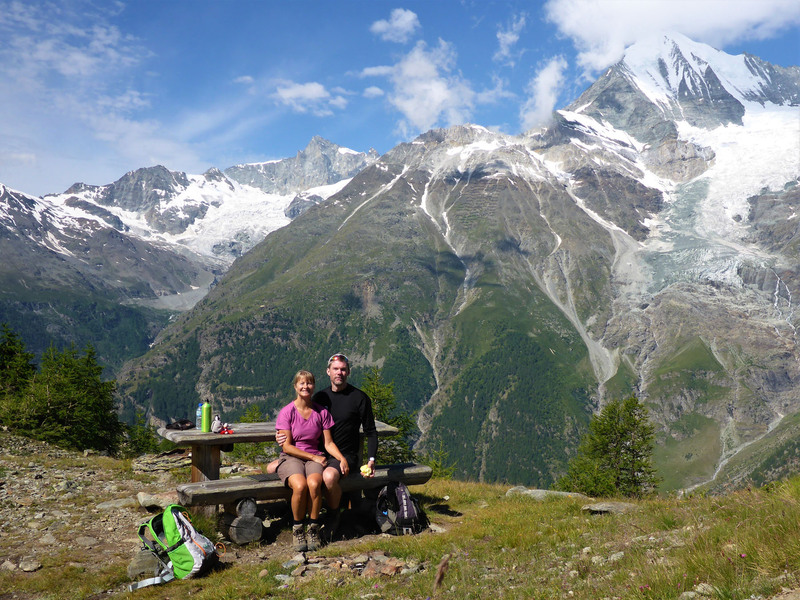 Both the daily freedom of the mountain hiking and the welcoming comfort of the hotels were our reward. In such clear weather there was no mistaking the path, so we walked free of concern. Each day, rather than bringing weariness, made us stronger. 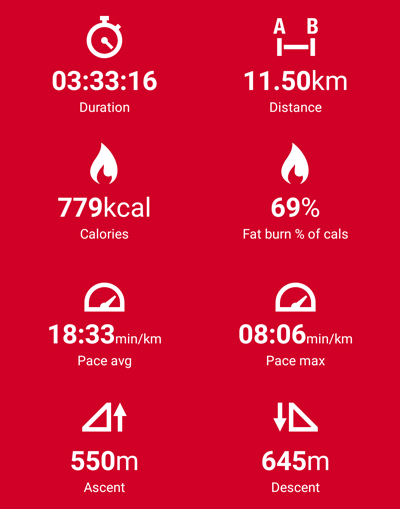 We got hike-fit by doing, each completed climb a strong, building session for legs and lungs. 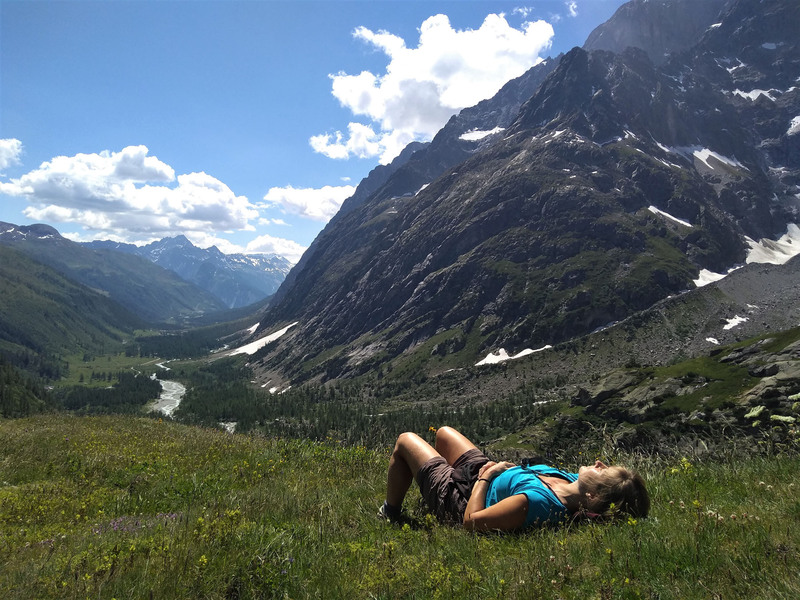 We grew to crave every tough rise, the constant sweat and burn of sustained effort and the joyous reward of a newly earned and compelling mountain vista. 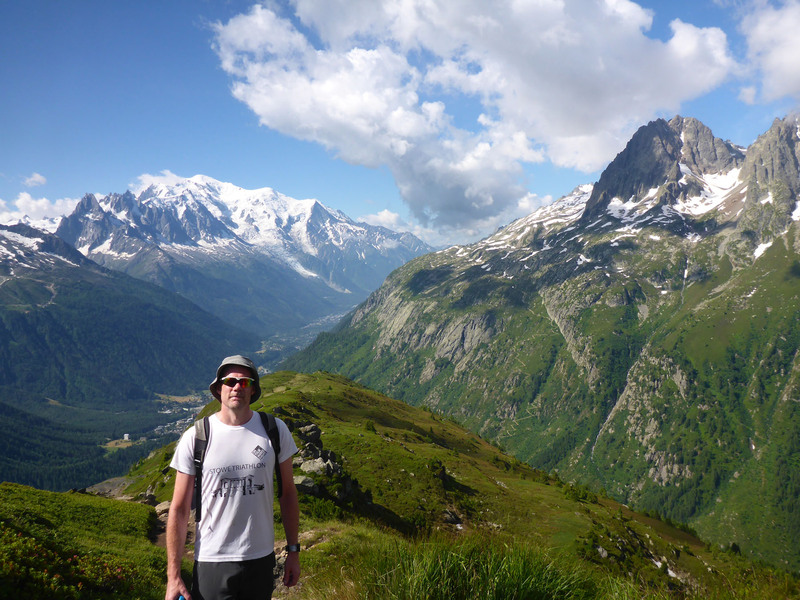 Each passing Col brought us the next visual wonder and a new valley to explore on the opposite side. At Les Mottets, we were sat on long wooden benches, by long tables, in groups of fourteen or more. Each course was brought out in huge serving bowls or platters to be distributed by each table of guests. We hesitantly plated up what we thought our share, trying to judge a fair portion and not offend our neighbours. But we need not have been cautious as unending refills were available to any who requested them. We ate hungrily whilst discussing the trail so far and sharing a sketch of our outside lives with the nearest others. Our hosts entertained us with traditional organ music from a colourful box, the tunes magically read from punched cardboard sheets fed into one side. Once sated, the majority retired to a night in the dreaded bed-lines of the cramped dormitory, but we had a coveted double suite. Despite our private room, we still suffered a disturbed night. Stiff from sleeplessness, we stepped slowly back into the glaring sun. Our day began with another cloudless sky over a dusty gravelled path that carried us upwards. We passed supine cows wearing thick leather necklaces hung with heavy brass bells before rising sharply along a series of stony hairpins to reach a grassy bluff, surrounded by a curtain of sheer grassy slopes. The dusty grey valley turned to green-yellow slopes lined with deeply-worn brown tracks. Minute alpine flowers speckled the grasses with dots of vibrant colour. We passed idle, furry marmots nuzzling in tall grasses. We crossed rivers flowing over wavy rocks, worn smooth with time. We marvelled at the swirling-lined strata under a shallow waterfall, veined with vivid colours, a freak creation of geology and water. Our rich salty sweat, mixed with sun-cream, all but blinded us as we rose sharply. Hours passed and the stubborn mountain greens gave way to patches of loose shale, steep and crumbling, and a return to a hard, all-grey landscape. The only softness found here were the ribbed blobs of last winter’s remaining snow, pristine white, untouched. A bright sea of hikers was dropping down the opposite slope, giving scale to our path, our only true reference in the monotone greyness. 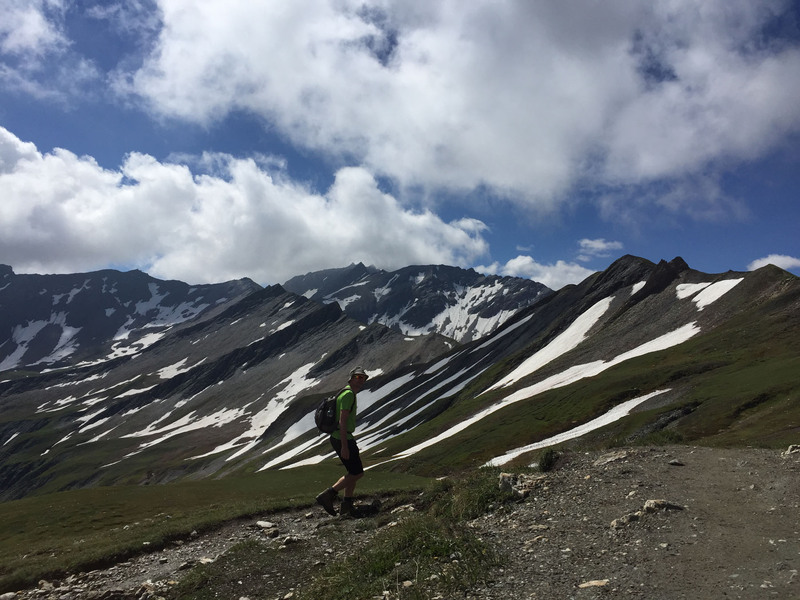 We stumbled onto a hard-to-see path, denoted only by knee-high cairns stood grey on grey against the discarded shale, and followed this up a long line of tight turns. 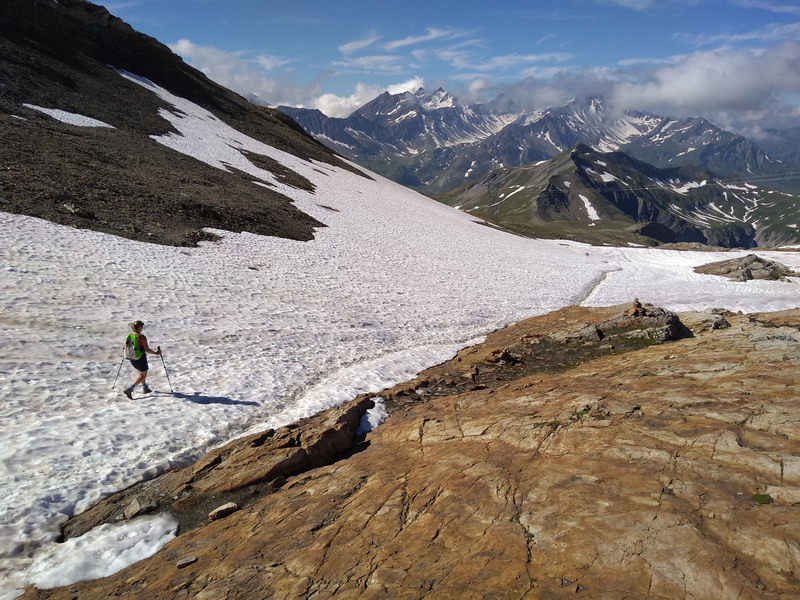 Eventually we were led to the snow-capped summit of the Col des Fours, at 2685m. We paused here, satisfied from our efforts. We took time to savour the moment, breathing in the thin cool air and examining the expansive view. As beautiful as each vista was, we always felt a constant impatience to keep moving. 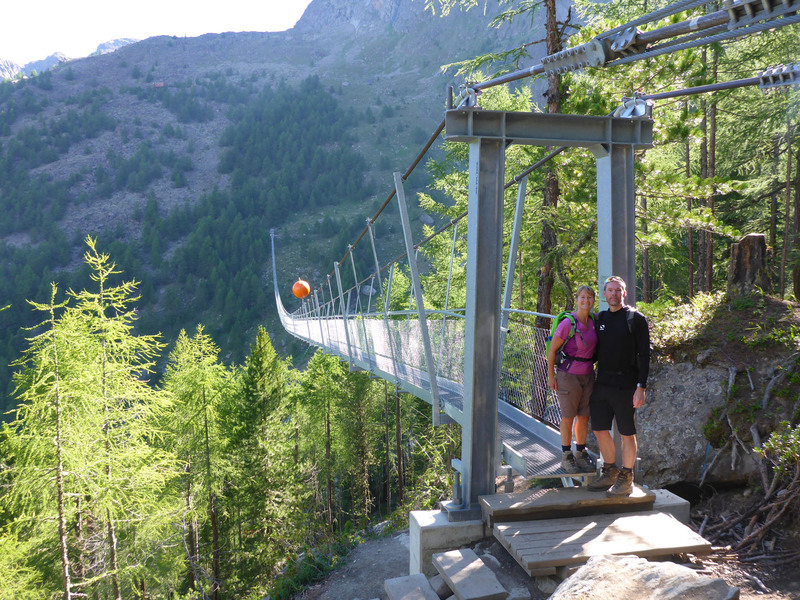 We knew we still faced a long downward path to reach Les Contamines. 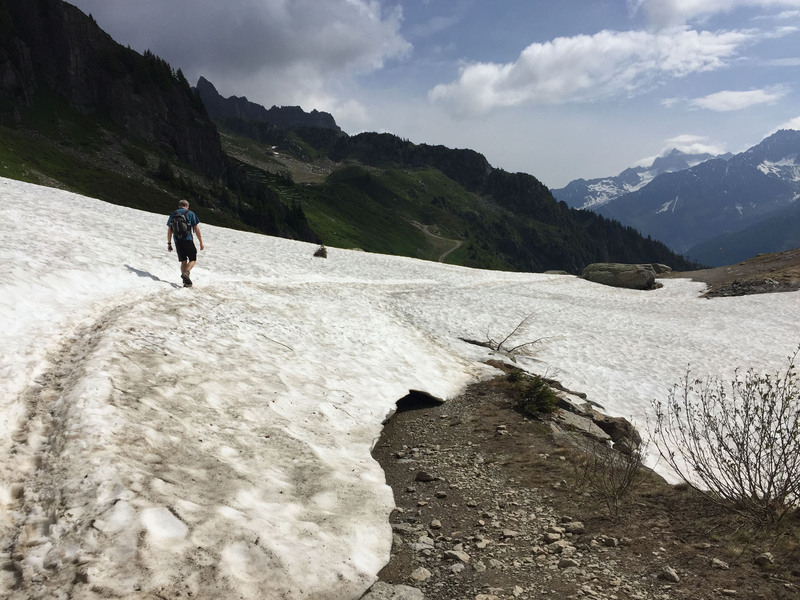 We dropped off the Col on long stretches of crisp-topped snow, with well-worn deep channels of muddy-brown slush denoting the path. 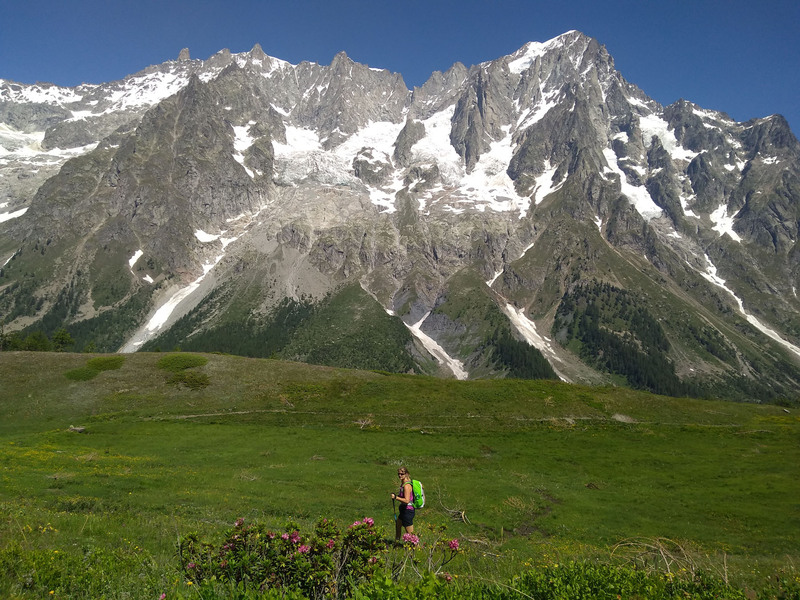 The kilometres fell away easily as we lost height, passing multitudes slowly slogging their way up to the Col des Fours. 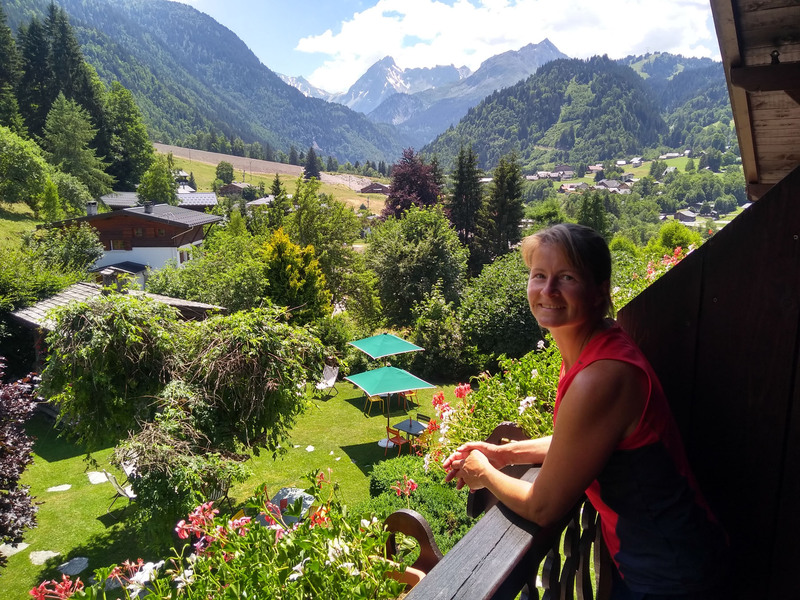 We fell alongside the green-glass river, passed pristine churches and scalloped rock pools of deep, frothing blue, to reach the outskirts of Les Contamines and our boutique Hotel Gai Soleil. We were treated to a tidy, characterful room with a balcony overlooking the gardens. The in-house chef prepared us a stylish reinvention of the traditional French raclette, serving salad, potatoes and hot, melted Camembert, followed by a wonderfully tart berry sundae. The hard kilometres fell away in sudden luxury. Our days passed in a familiar pattern, each flowing inexorably into the next. 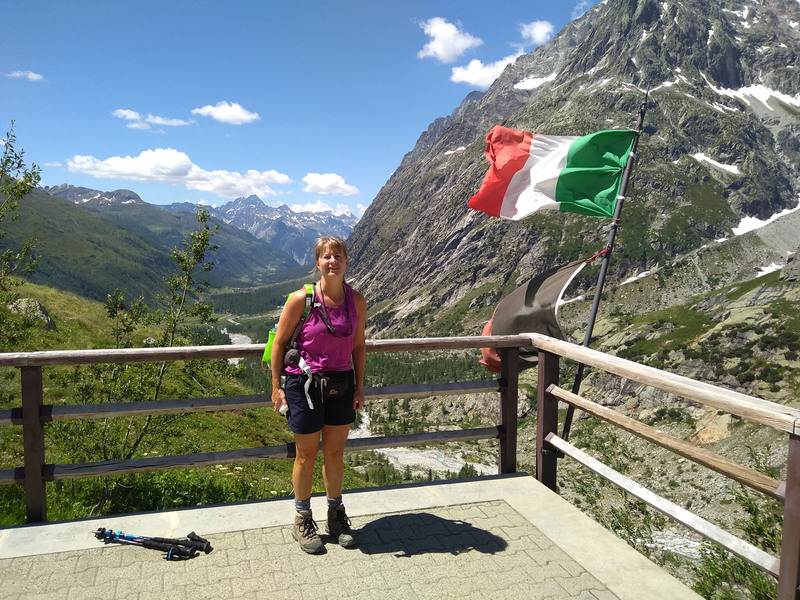 We crossed from France to Switzerland to Italy with little change but the daily greetings we shared on the mountain pathways. Each day we climbed high and each night slept low, secure in small valley settlements or in lonely mountain refuges. We rose early to breakfast and began walking before the sun broke in glorious rays over the peak-lined horizons. 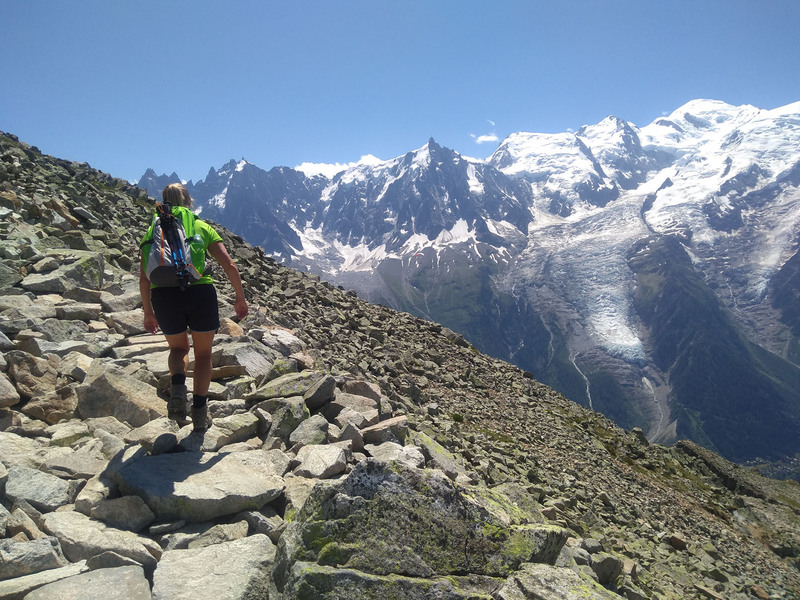 Days began with a steep return to re-join the main circuit, and the cooler dawn air was a welcome relief as we forcefully regained the altitude lost the day before. We found the trail became a series of moments, of views, sounds and smells, each vividly distinct yet impossible to separate from the whole. Everything seen was but a glimpse, an ephemeral whisper of the landscape. 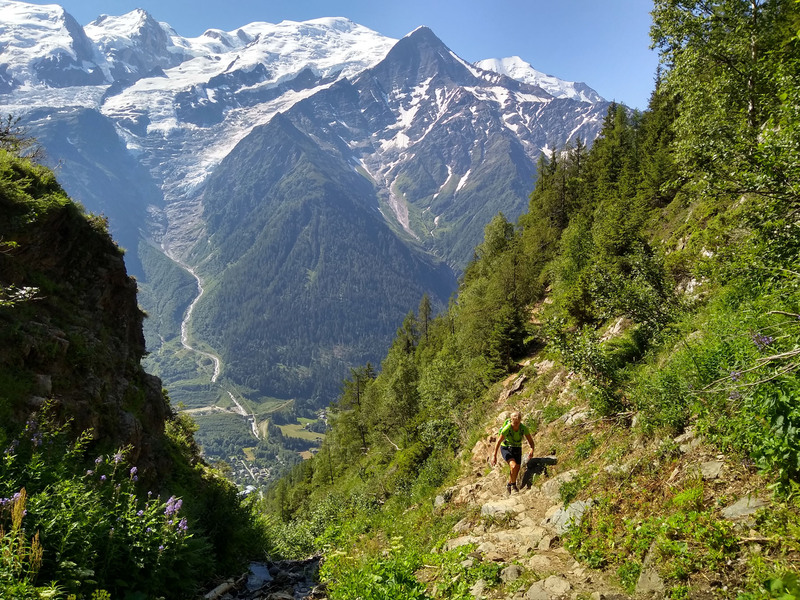 Rising out of Les Houches, the deep shade of the woodland trees brought some relief from the sun’s direct oppression, but offered little respite from the intense heat of the still, close air. When the wind blew through the branches we instantly felt renewed, revitalised, our repressive tormentor temporarily removed from our burning skin. The path was formed from gnarled, swollen roots jutting out of dust-brown soil like giant arthritic knuckles attempting to escape a grave. Grey boulders sat immobile between the roots, forming helpful steps or high barricades to assist or slow our progress. The dry soil was scalloped in places from the passing of a million boots. We climbed in silence, and with no view out through the dense trees, we both looked inwards instead, pushing ourselves with a quiet intensity. 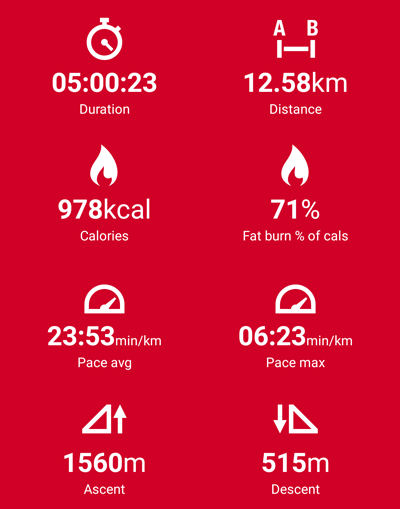 The burning satisfaction from our steady efforts kept us striding out strongly. We rose high, yet were more affected by the intoxicating closeness of the stifling afternoon heat than any achieved altitude. 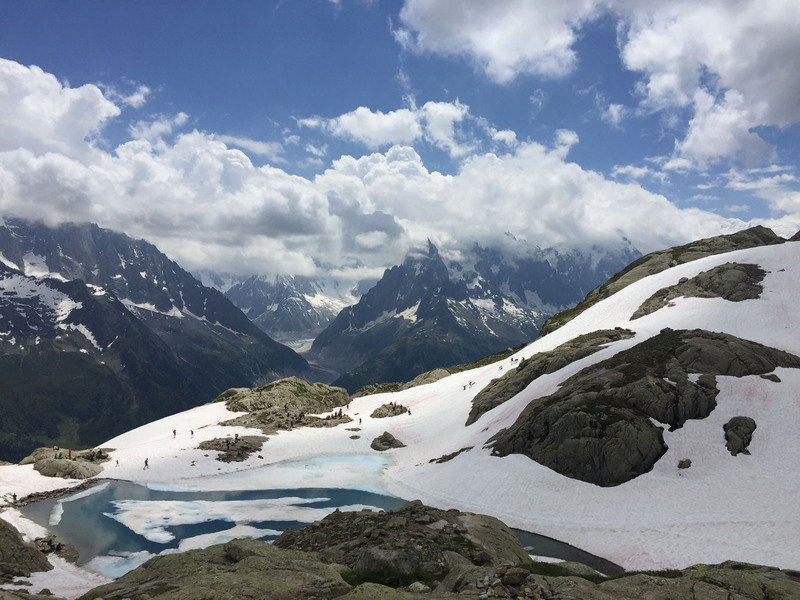 In many ways the higher passes, over 2000m, were a relief to us as they came packaged with a welcome breeze and much cooler air. 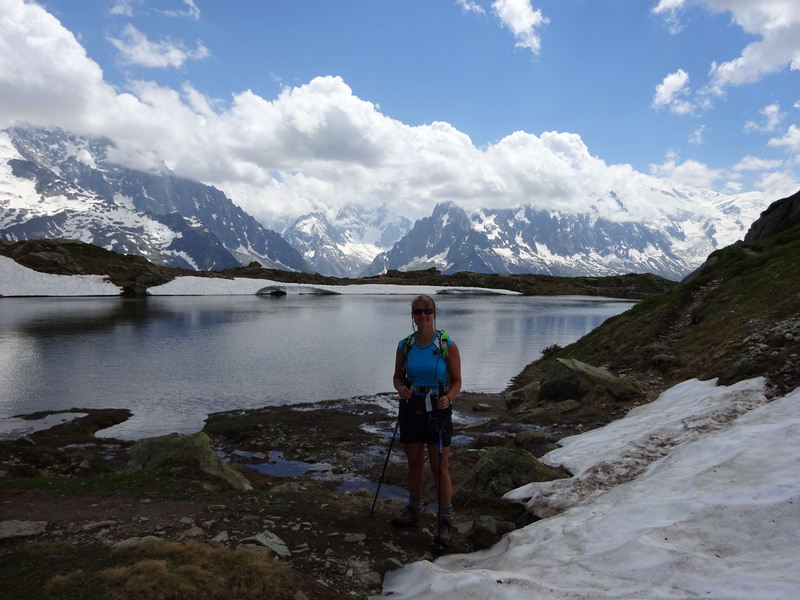 We passed by Refuge Bellachat and entered a different landscape, a grassy plateau of bumps and lakes. This suddenly changed again to a sculpted path of flat boulders, built as steps, weaving through a loose, grey moraine. Beyond here we reached the crowded lookout at the top of Brévent lift at 2525m, our final climb complete. 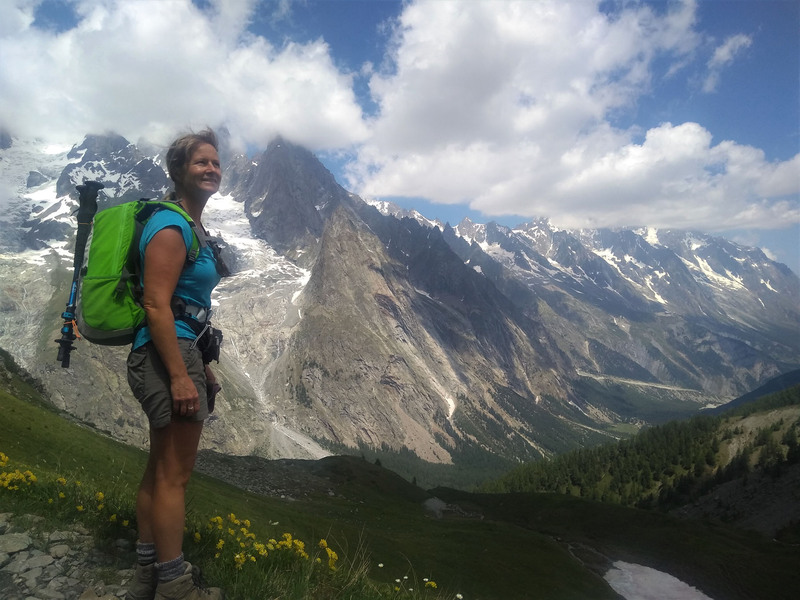 With quiet celebration, we began our short descent through snowfields and grey dust to return, days later, to the top of Plan Praz, set above Chamonix. 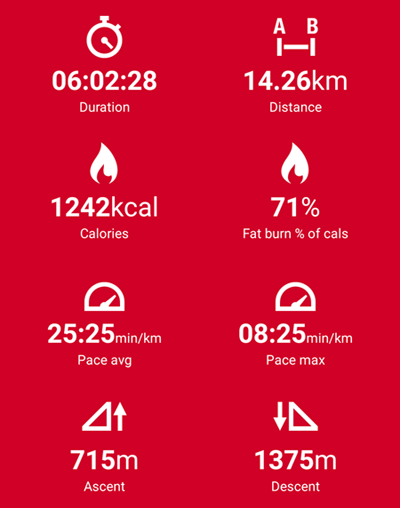 We completed the walk, our distances measuring a total of 183km including offshoot tails to reach accommodations. The route may have looked wild, challenging, even escapist on occasion, but it never truly felt it. 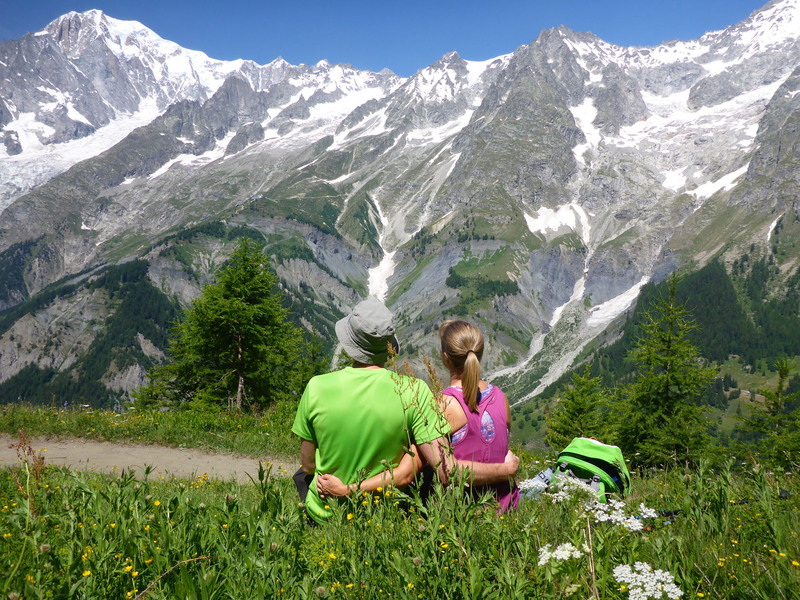 We were always close to safety, to other hikers, to the easy comforts of a hotel. We never thought of ourselves as being alone, isolated, even if experiencing that hint of danger or spark of adventure was something we both deeply desired. 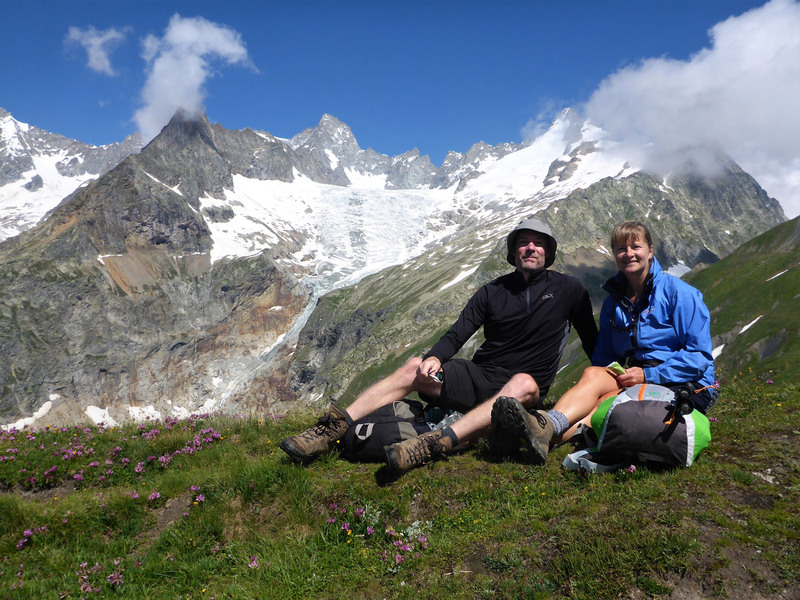 It was a tame, civilised hike, a calm and comfortable multi-day wilderness walk. 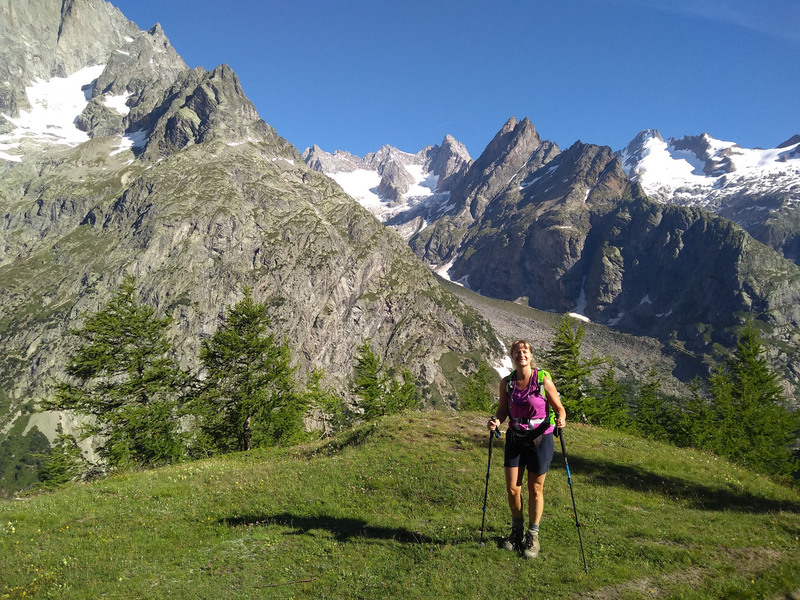 It may not have proved to be the difficult, testing physical or mental challenge we had expected, even craved for, but it remains a wonderful route replete with quiet, thoughtful beauty and deeply impressive mountain scenery. And we can’t rightly fault it for that. 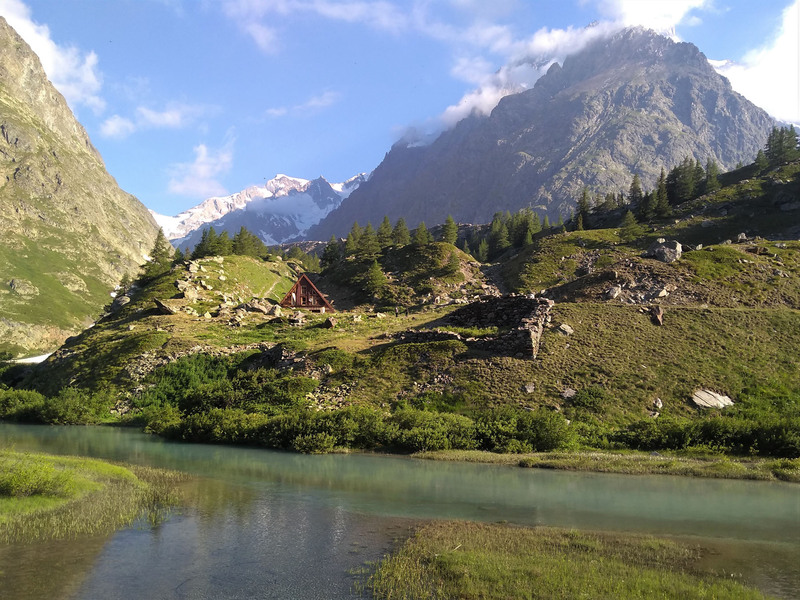 This entry was posted in 2018 Summer Tour, France, Hiking, In France, In Italy, In Switzerland, Italy, Our Travel Journal, Switzerland and tagged Alpine, alps, Circular route, France, Hiking, Italy, mountains, Multi-day walking, nature, photography, sports, Switzerland, TMB, Tour du Mont Blanc, travel, vistas on Aug 27, 2018 by Aaron Hill. We awoke early, ate breakfast before 7, packed and were out walking by 7.35am. It was still dark in the valley, with a low haze that soon burnt off in the morning sun. 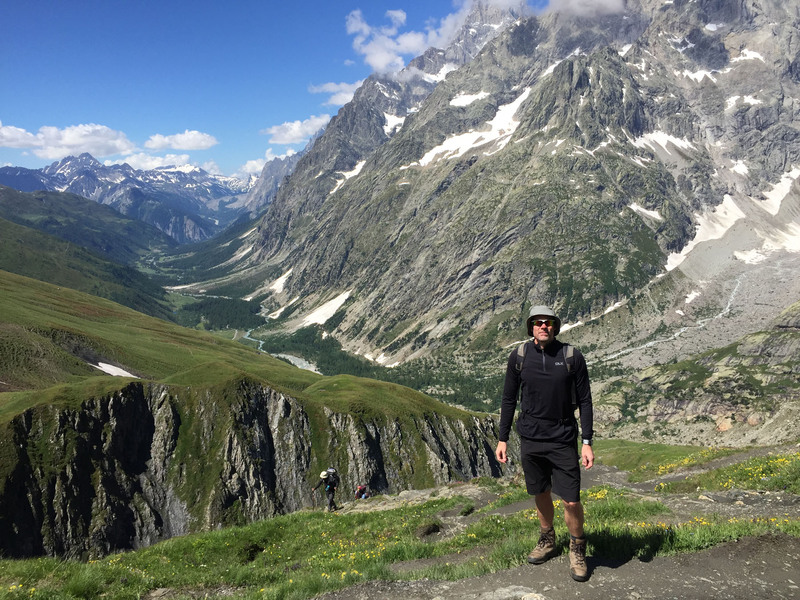 We followed an easy path to start, passing small glacial lakes and supine cows with wide leather collars supporting heavy brass bells. We then faced a long, steady slog uphill on a winding gravel track, before cutting off to the left to join and then conquer a grassy bluff. The terrain looked just like fells on Welsh mountains, rolling grassed slopes with tiny flowers adding colour. 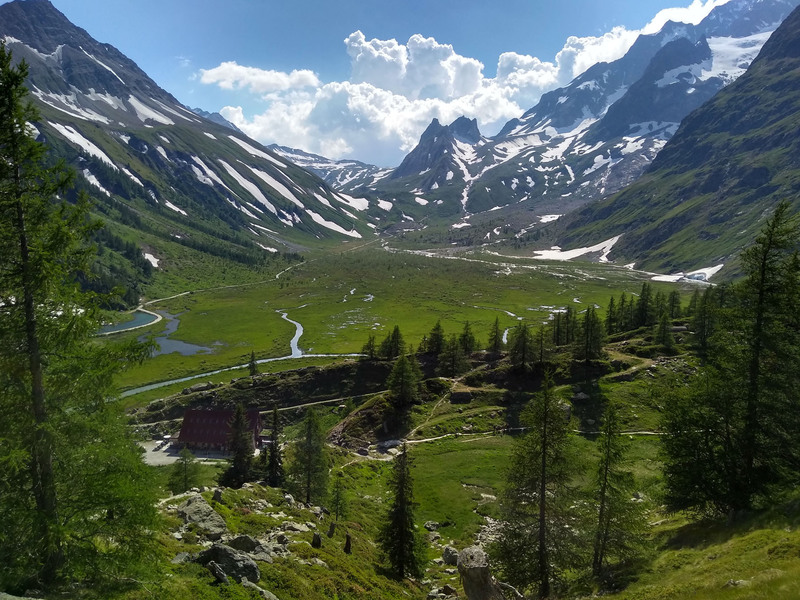 The path forward rose steeply up dusty shale slopes, passing by wave-formation rocks formed by curvy, coursing waterfalls and groups of calm marmots nuzzling in the long grass. 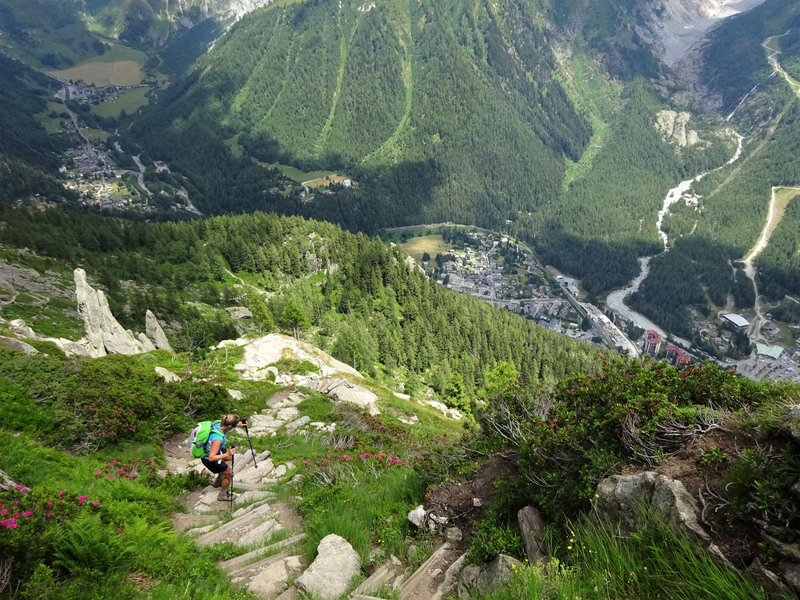 The long steep shale continued unabated, with almost three hours of hot, sweaty work and several false summits to be defeated; the true top continued to elude us. 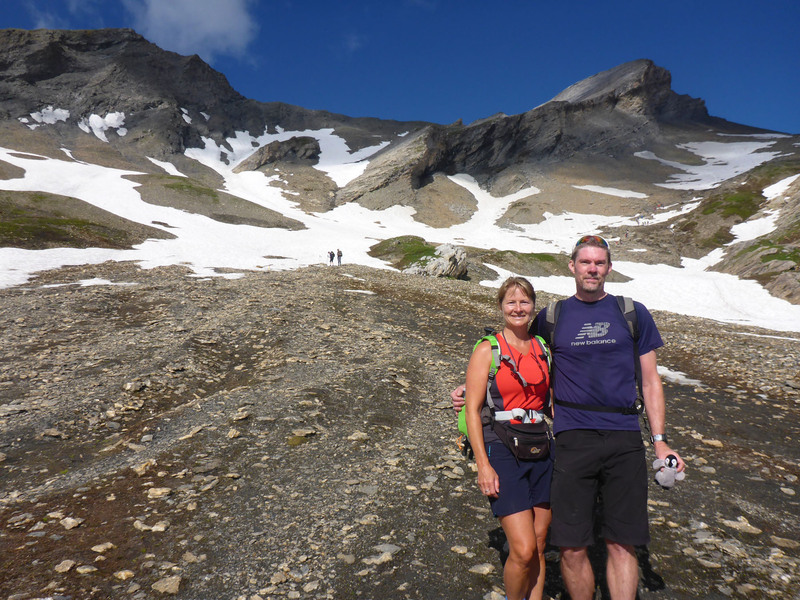 We reached a wide plateau before the final climb, filled with snow patches and the first walkers we’d met today. We managed to avoid most of the snow by keeping to the right and slowly shuffling up a narrow route marked by small cairns. 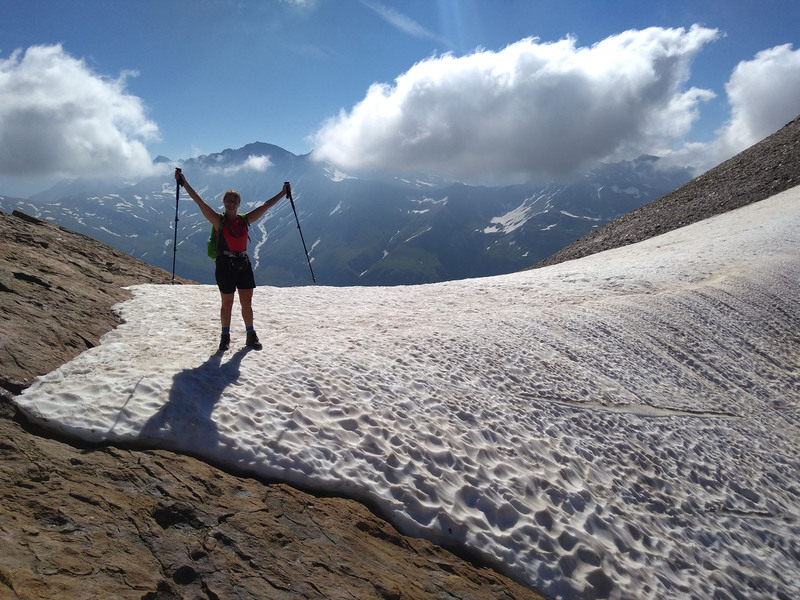 We continued up this steep, loose shale, breathing hard, all the way to the hardened snow capping that marked the domed top of the Col des Fours, at 2685m. After catching our breath and enjoying the moment, we faced a long descent over red rocks and well-trodden snow, following the easy trail ever downwards. Various grassy plateaus punctuated these downhills, adding a welcome vividness to the otherwise stark landscape. 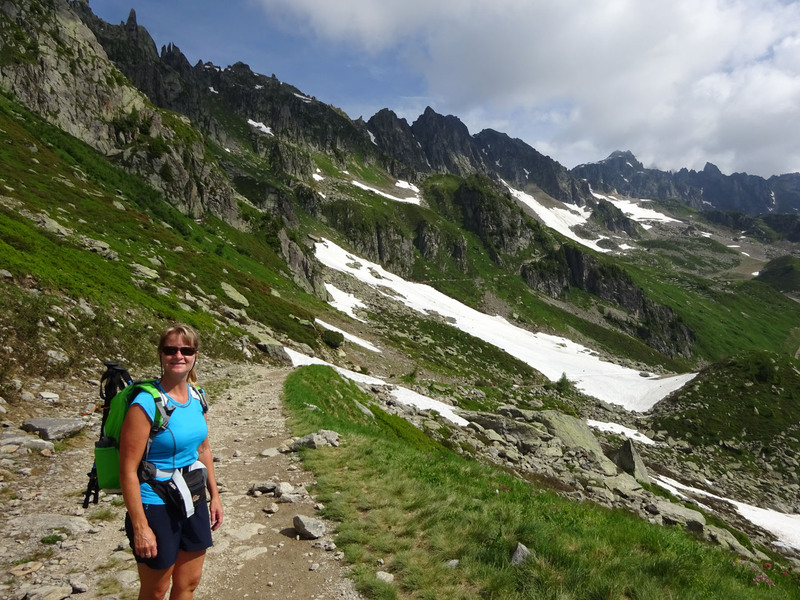 We soon passed Refuge Bonhomme, a popular stop for walkers on this route, but we were pushing on further. 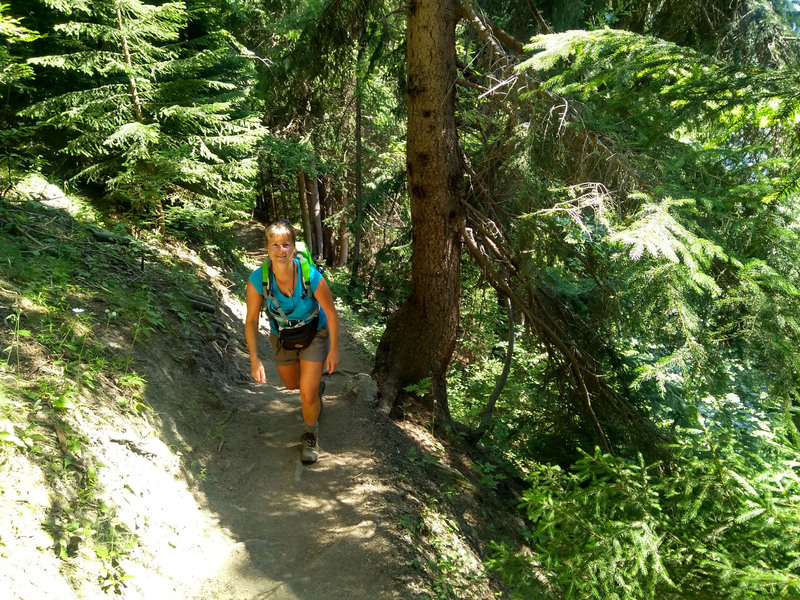 We ran little portions of the downhill trail as it was easier on our knees than to continually fight against gravity. Soon we stopped at another popular refuge for snacks and Nicky bought herself a TMB T-shirt as a memento. 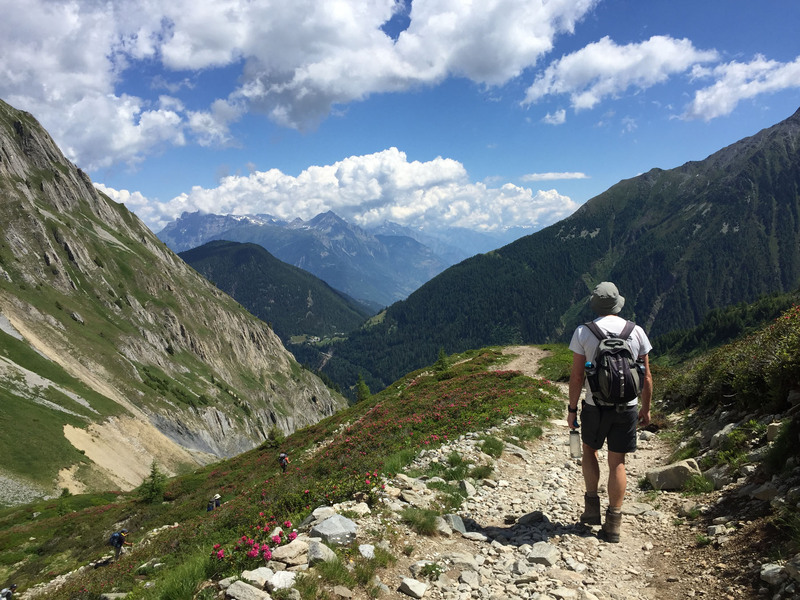 We followed a long, dull path constantly downwards, with many walkers slowly clambering upwards to the Col. 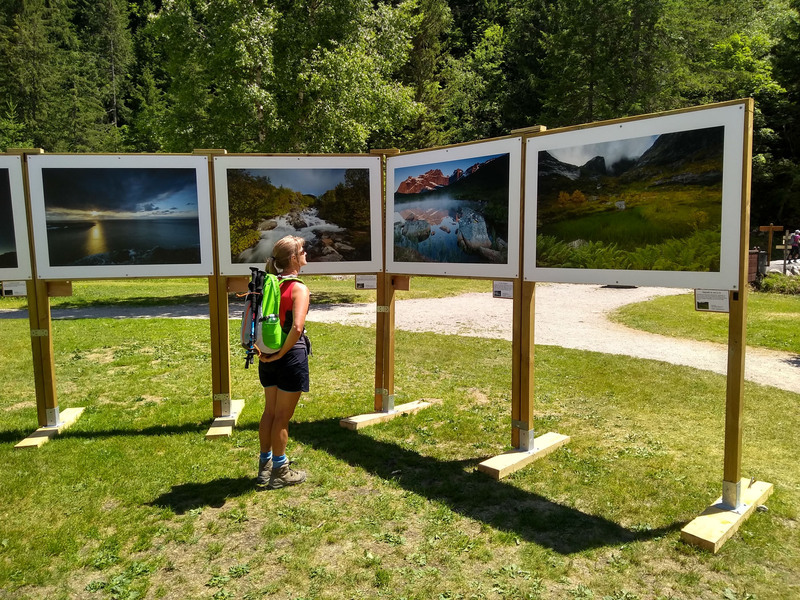 Nearing the valley floor, we stopped to examine a colourful display of photographs of Norway set outside a small church, recognising many of places we’d visited to on our travels there last summer. We crossed a small stone bridge that had smooth, swirling blue pools under, formed by a raging waterfall. 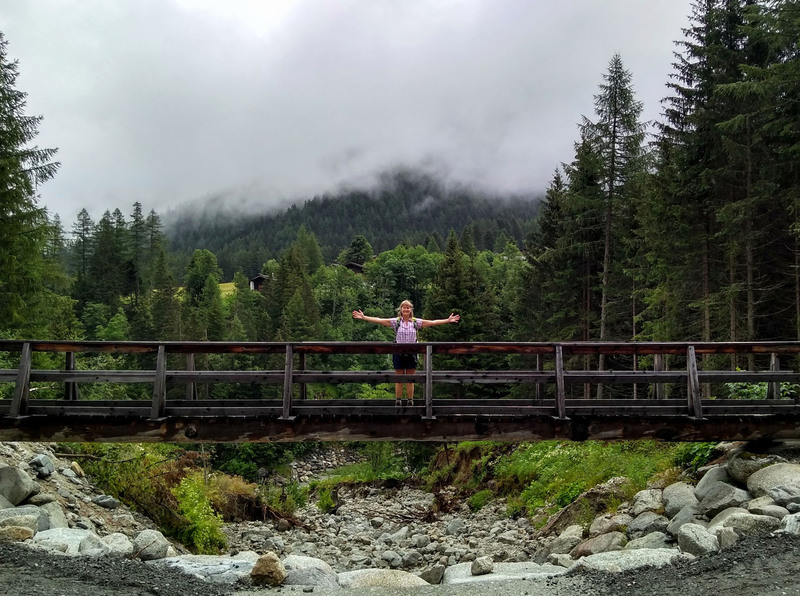 We followed the river into Les Contamines, undertook a quick supermarket shop and then checked-in to the wonderfully boutique Hotel Gai Soleil. We were treated to a great room with a lovely balcony overlooking the gardens, where we enjoyed beers until dinner. The in-house chef prepared us a stylish take on a traditional raclette meal, with salad, potatoes and hot, melted Camembert, followed by a wonderfully tart berry sundae. Satisfied, we then retired to our room to sadly watch England lose to Croatia in the World Cup semi-final. We ate a leisurely breakfast at 8, in no rush to be on our way today. 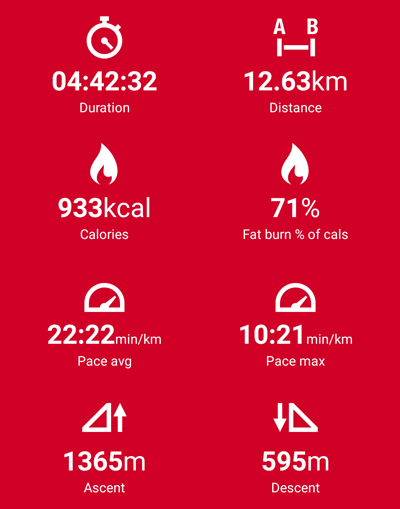 We were nearing the end of our walk, and feeling stronger every day. 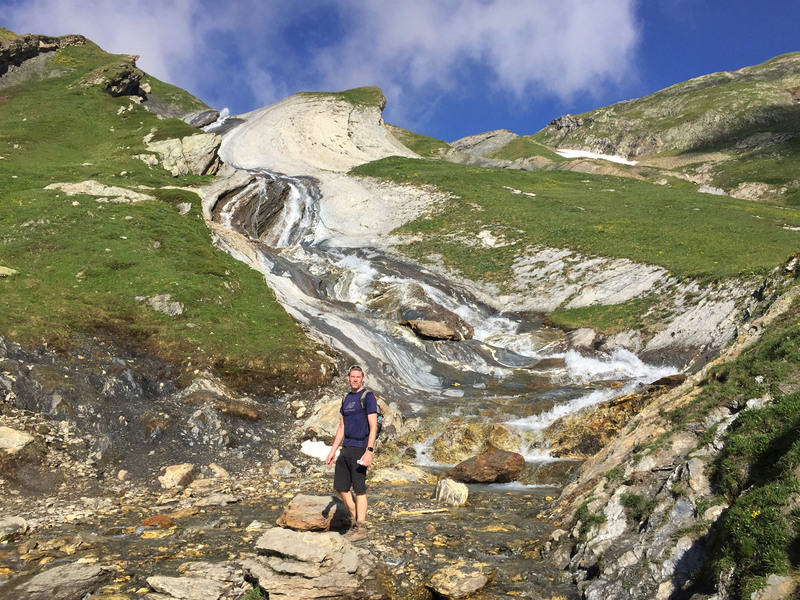 We understood we had plenty of time to complete today’s trek back to Les Houches. The town was still and quiet under another cloudless morning sky. 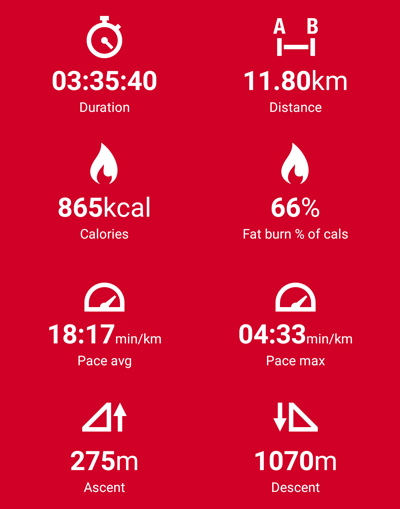 We returned to the church then followed a flowing forest trail alongside the river for a few kilometres before the path diverted and began to climb. 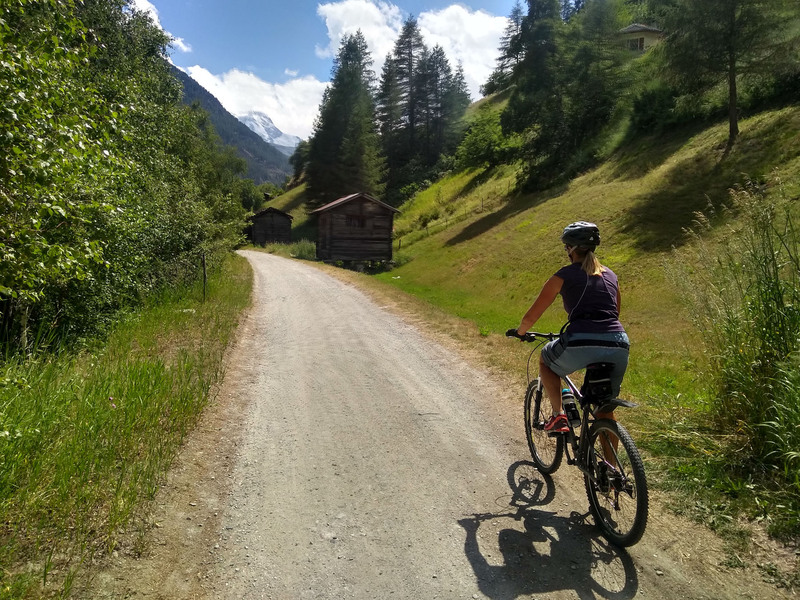 It took us on harshly steep gravel tracks through picturesque tiny hamlets, with pretty rolling meadows and neat timber chalets on all sides. 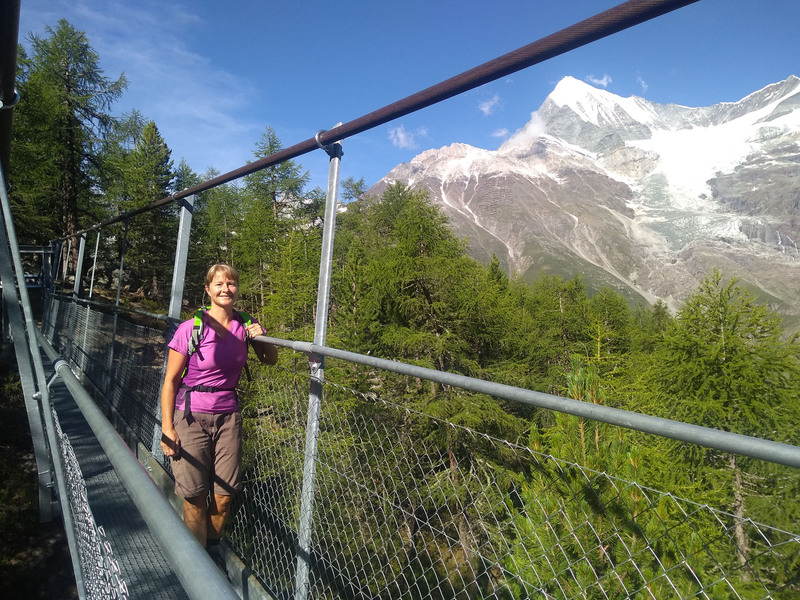 The path had a quiet charm rather than the spectacular mountains of previous days, with simple alpine views surrounded at a distance by the big peaks. The path meandered into shaded woodland areas with small waterfalls and past small local churches in tiny villages once cut-off entirely during snowy winters. 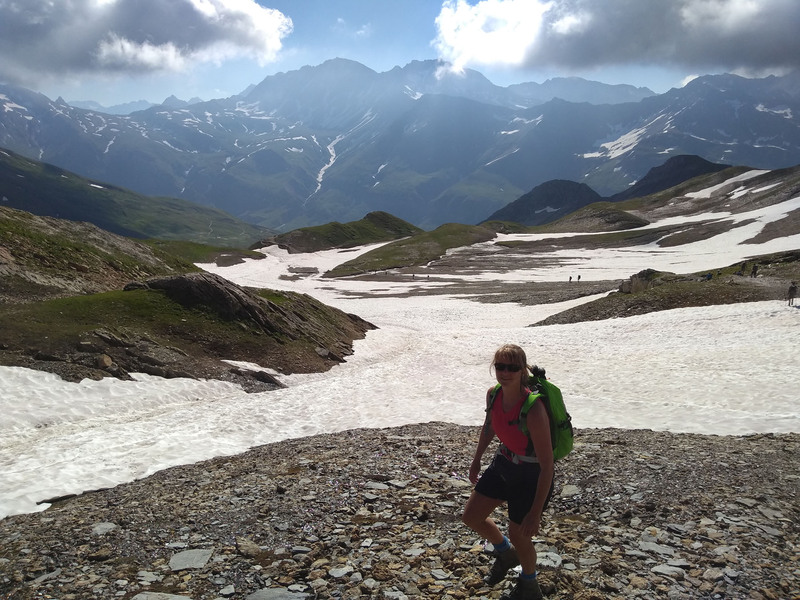 We faced a steady climb to reach Col de Vosa at 1672m, where we paused for a while to examine the mountain railway and enjoy views of expansive valley below. 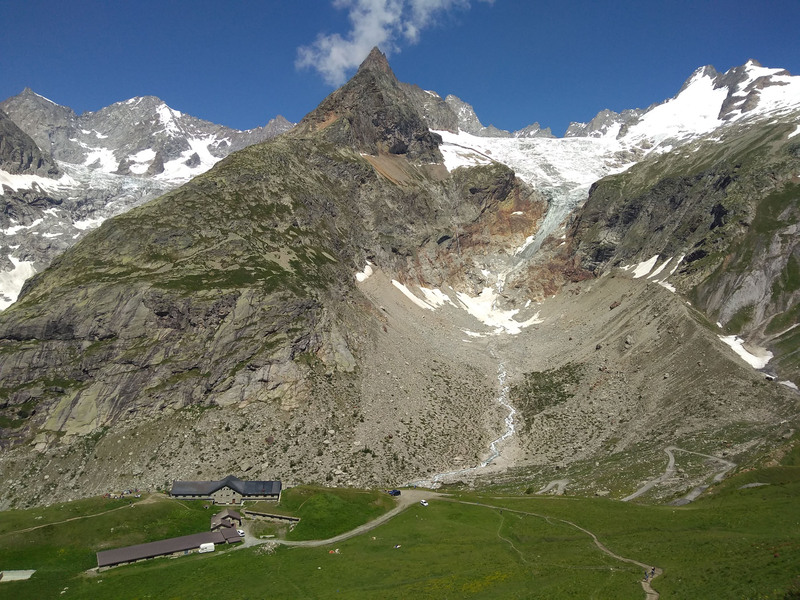 The mountain train line ran steeply up to visit glacier de Bionnassay and back down to the valley floor, centred on a huge hotel complex on the col plateau. 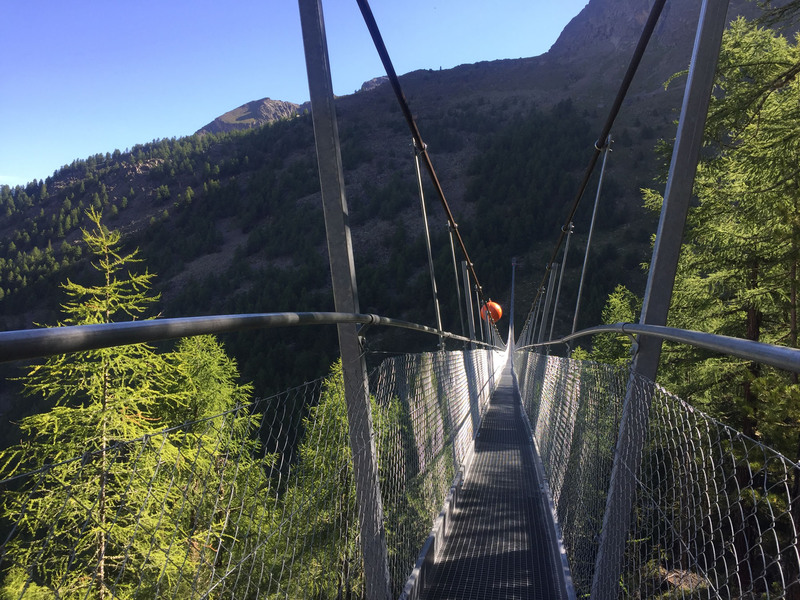 From here we could have caught one of two cable-cars down to the valley floor in Les Houches, but that then would leave a portion of the loop unwalked, our main task incomplete, so downwards on foot it was. 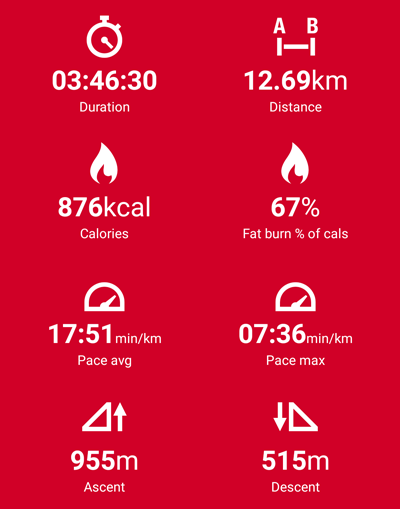 We followed the long, steep descent, again enjoying jogging short portions of the easy trail to utilise gravity and save our knees. 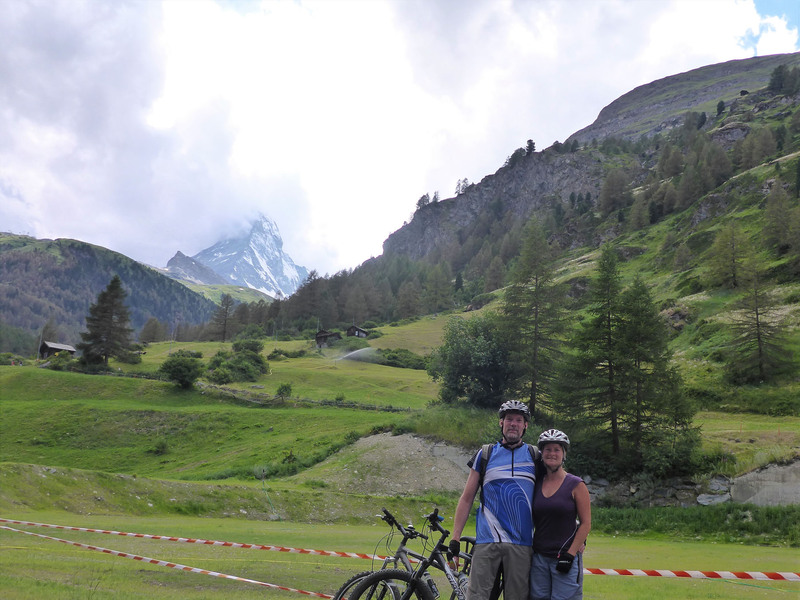 There were many mountain bike trails in this area and we watched a few riders struggle up the steep climbs, alongside a few others not struggling so much as they had electric-powered full-sus downhill bikes, a new sight for us. The last few kilometres were on the side of the main snaking road, easy walking down close to town. 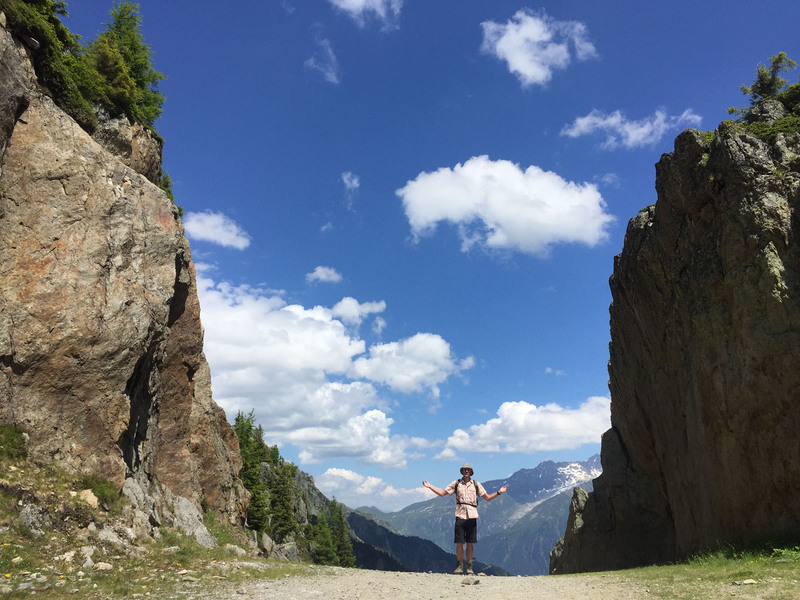 We found a narrow off-road cutback that led us back on to familiar roads in the heart of Les Houches. 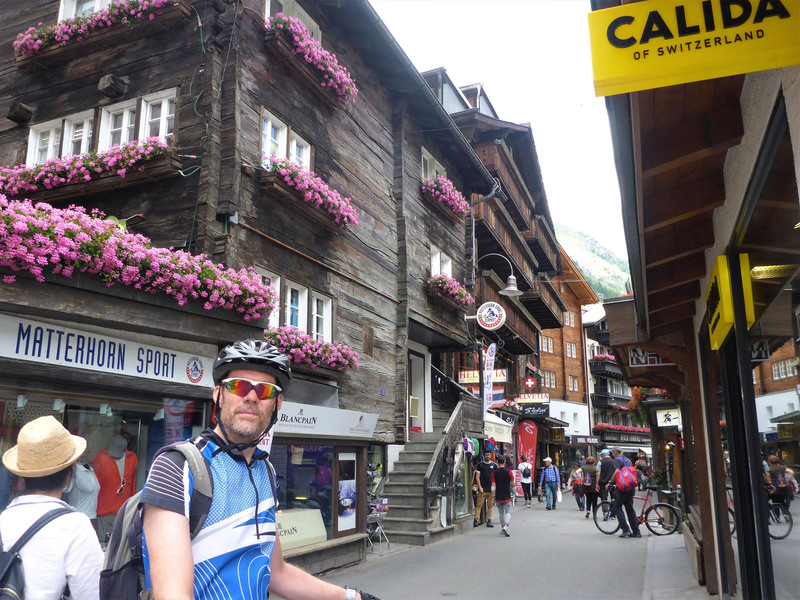 We had our usual pit-stop in a local shop and then on to Hotel du Bois. 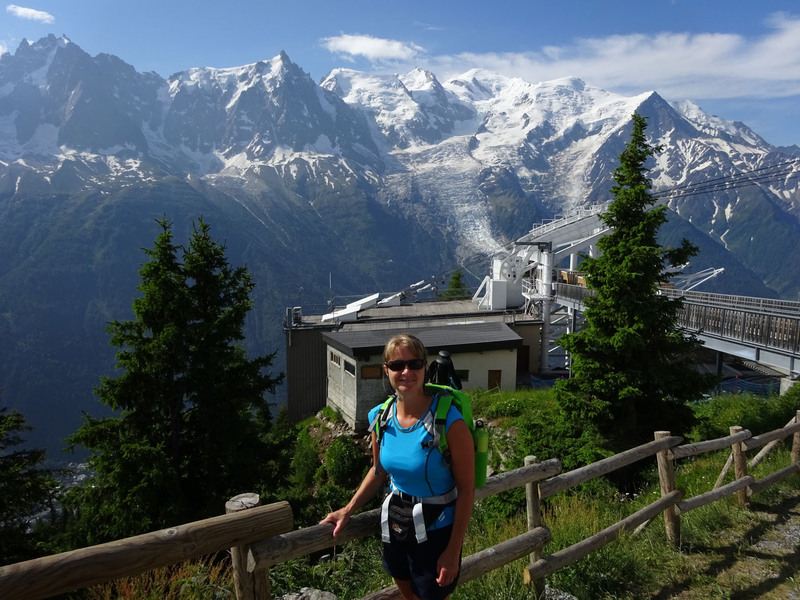 we settled into our quite luxurious room with a sunny balcony offering great views of Mont Blanc massif. Again we treated ourselves to beers until dinner, where we truly enjoyed the treat of steak and chips and crème caramel to finish. We treated ourselves to a long lie-in as our bag was not being transferred today. 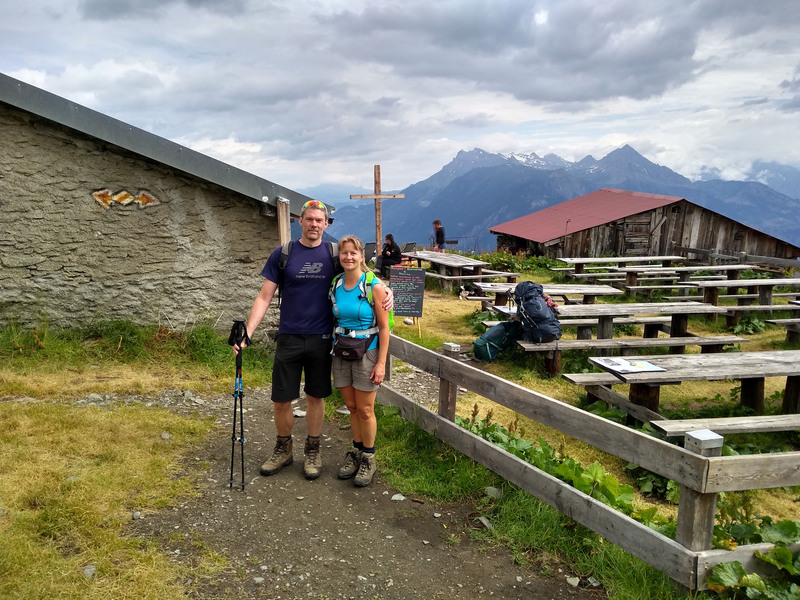 We felt like with being back in Les Houches we’d already finished, and that this final day of hiking was a separate day-walk, unconnected to all our recent efforts. We enjoyed a late breakfast (complete with usually elusive bacon) and were out walking just after 9am. We crossed a bridge over a raging stretch of river before turning right and following a typically root-strewn forest trail. The path was mostly in welcome shade but the air was still very close and stifling, and we were soon soaked in sweat. 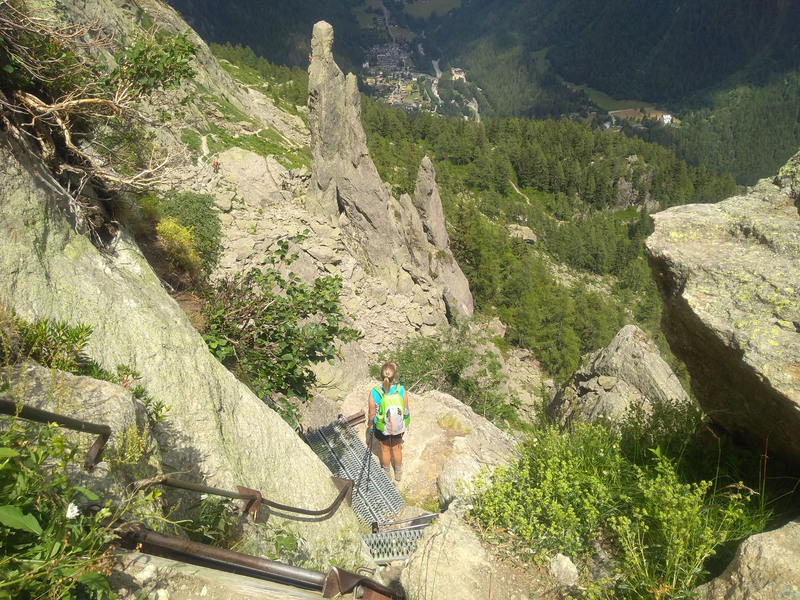 We later faced a tough, unrelenting gradient over tall boulder steps, climbing ever upwards. We passed lots of others on the trail, going our way but moving slower, as we pushed on. We were both inpatient to break out of the suffocating heat of the forest and find some cooling air. 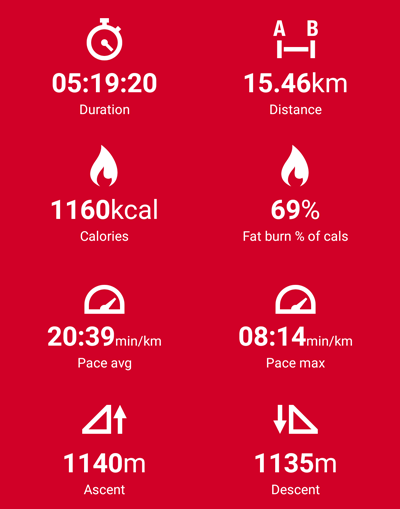 so were moving fast, working and sweating hard as we went. After two hours we finally escaped the grasp of the tree-line and received our reward of a cool mountain breeze and spectacular views. 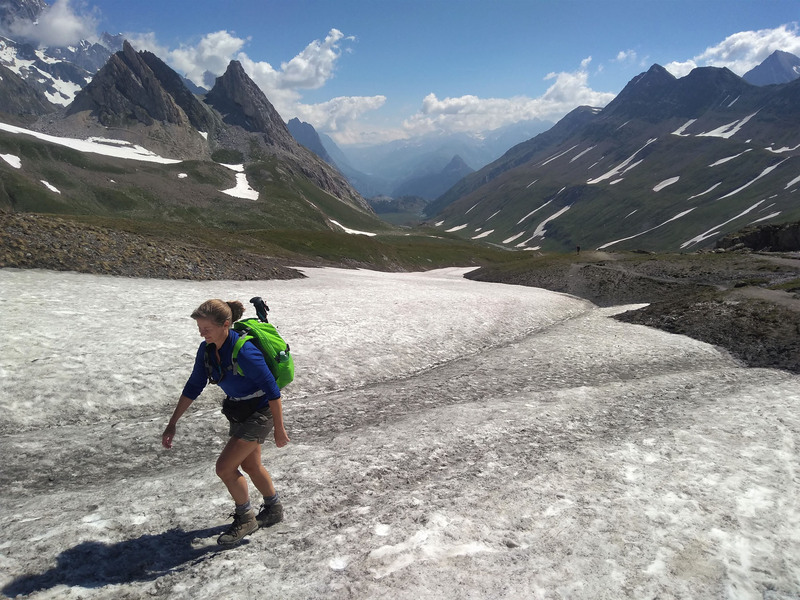 We faced a few scramble portions with fixed chains and hand rails to assist, before arriving on a grassy plateau, next to Refuge Bellachat. The refuge, very disappointingly, would not to give us any water, the first refusal on the whole TMB route. We sat on the grass nearby and ate fruit cake and cooled off. The path headed ever upwards, over a few small snow portions to reach another wide grassy plateau area, almost like moorland, peppered with narrow pathways in all directions. 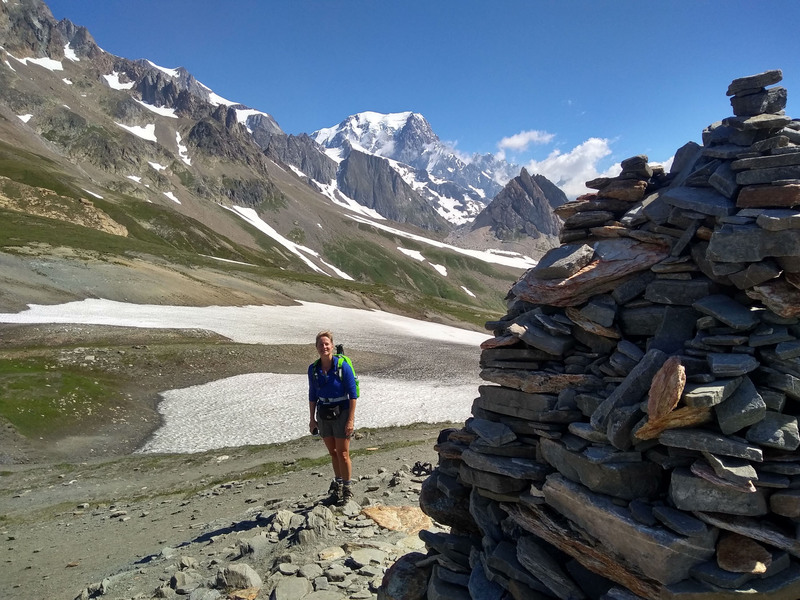 The terrain soon changed again to large loose boulders and we slowly rose up a series of tight hairpins to finally reach the lookout at the top of Brévent lift at 2525m. It took us 3 hours 20 mins of hard work to reach here, so we celebrated with an ice cream and coke, reclining in deckchairs with one of the best views of the whole TMB. 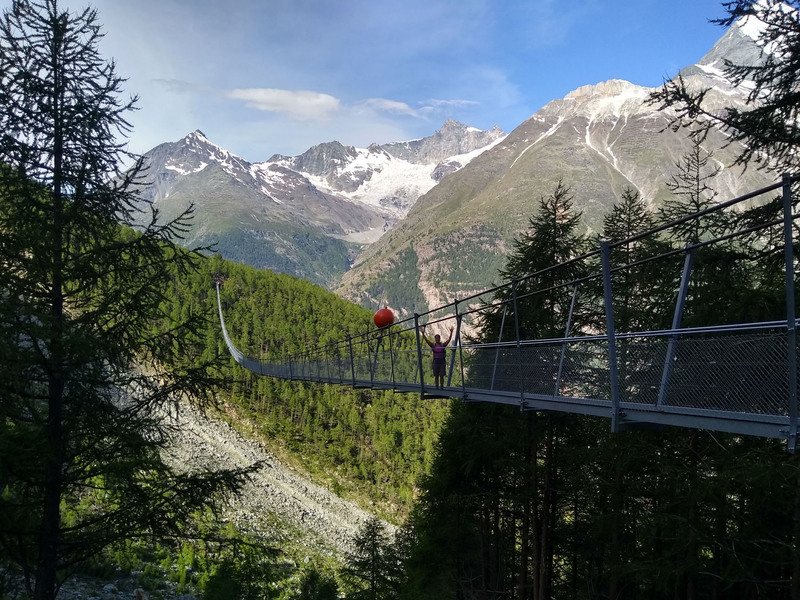 We are surrounded by milling crowds, the most on any stretch of the hike, as a gondola lift smoothly transports Chamonix-based visitors directly to this high spot. We dropped down loose shale and across several snow patches, past lots of rock towers with trainee climbers and paragliders circling above us. 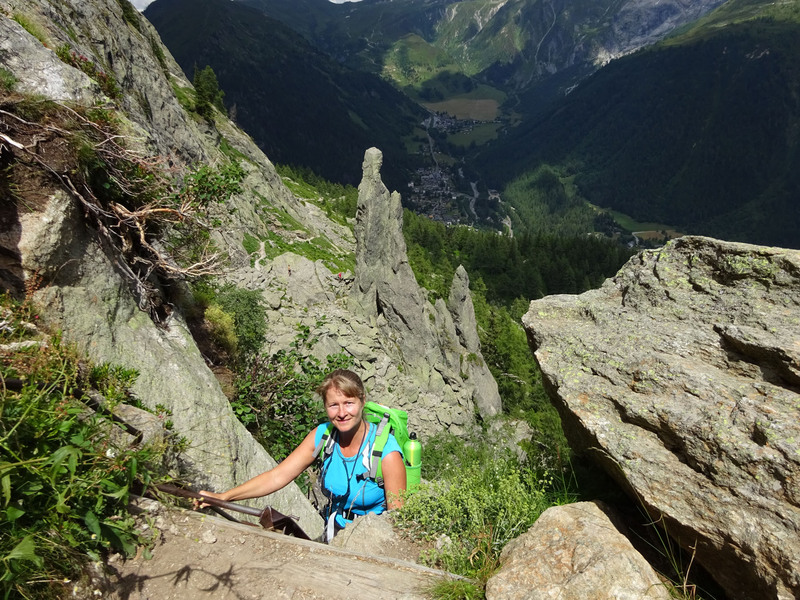 We had only 3km further of easy downhill on dull grey moraine to reach the top of Plan Praz, our circuit fully complete. We walked slowly, both wanting and not wanting it to be over. 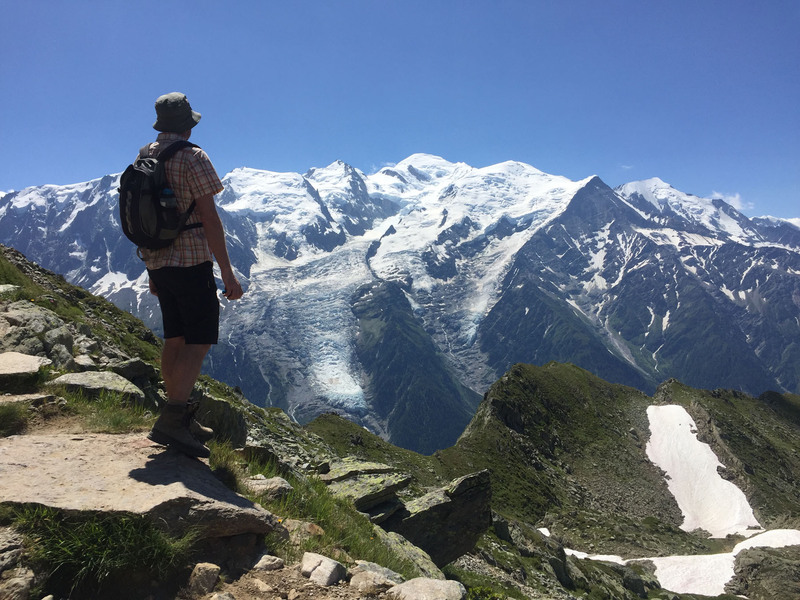 We paused here a while to stare at the view and reflect on what the last 10 days had entailed, before catching the lift back down to Chamonix centre. 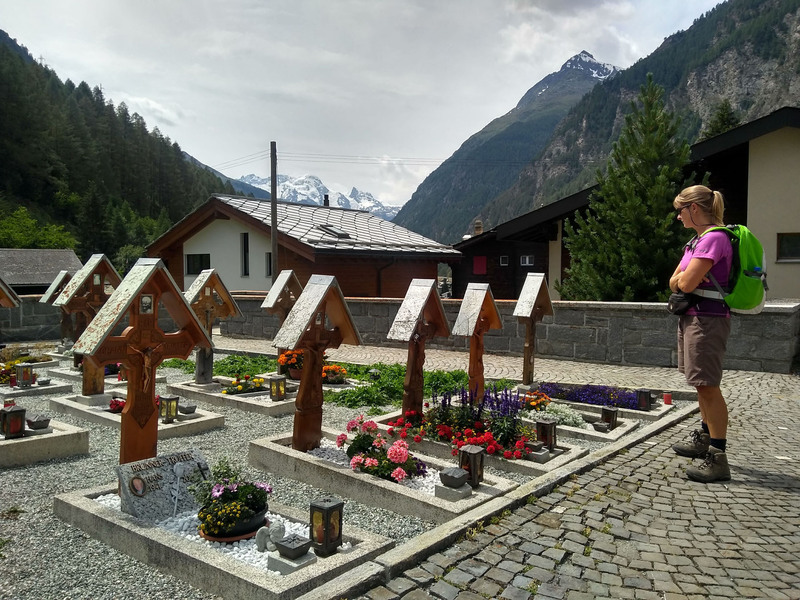 We caught a bus back to Les Houches to collect our luggage at Hotel du Bois, then walked with our bag the short way back to our campsite and to our patiently awaiting Benny. 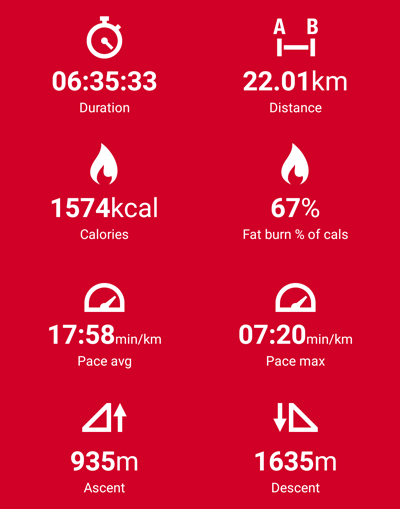 TMB – complete! 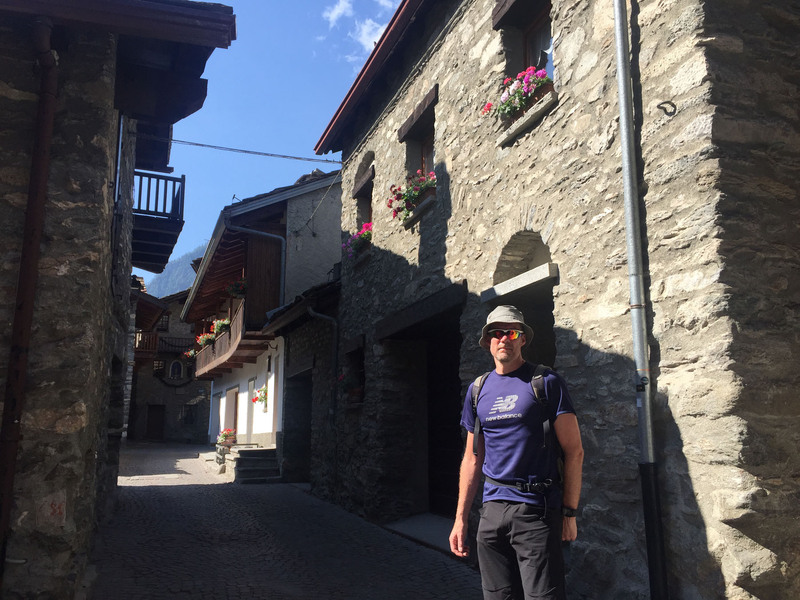 This entry was posted in 2018 Summer Tour, France, Hiking, In France, In Italy, In Switzerland, Italy, Our Travel Journal, Switzerland and tagged Alpine, alps, Circular route, France, Hiking, Italy, mountains, Multi-day walking, nature, photography, sports, Switzerland, TMB, Tour du Mont Blanc, travel, vistas on Jul 27, 2018 by Aaron Hill. We were up for breakfast at 7am, perky and ready to go. The view of the surrounding mountains was now clear and impressive, set under deep blue skies. 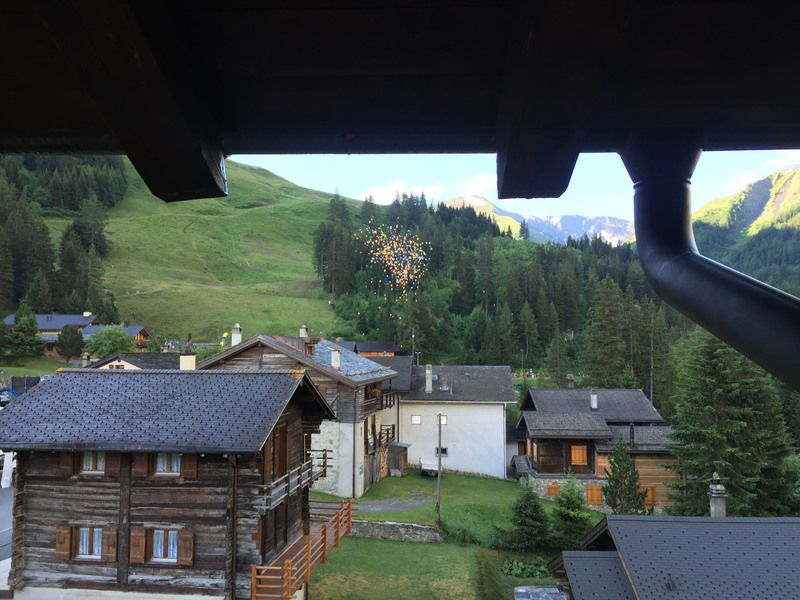 From our room we watched a large balloon release to mark the start of the 42k / 111km mountain Ultra-race. We dropped off our bag then walked out of town along the road, then cut off right to move gradually uphill in grassy fields. At one point an angry rogue cow partially blocked our route and we had to detour around her aggrieved grunting. We faced a long ascent but with a steady gradient and a good path underfoot we made good progress. A cyclist passed us going up, looking hot and bothered. We arrived at Refuge La Peule and considered buying lunch, but didn’t as it was not yet 10am and we’d have to carry it. 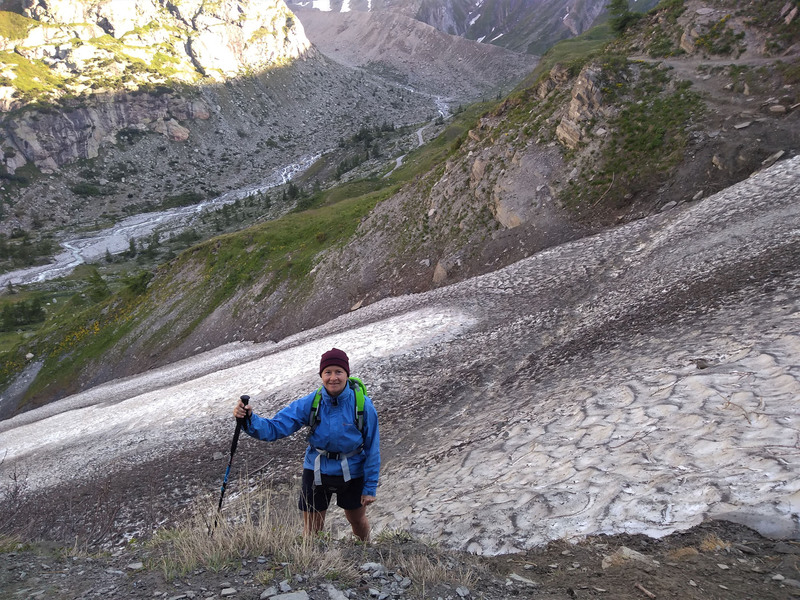 Instead we continued upwards towards Le Grande Col Ferret, passing over five or six wide patches of remaining snow, each with a well-trodden path that was easy to cross. It was cold and breezy as we passed the tall stone cairn at the Col, but we soon dropped down the opposite side, out of the chilling wind, where we found a nice spot to rest and eat snacks. We had an amazing view of two crawling glaciers buried deep in steep mountain sides, a vista that dominated our route most of the descent. We passed many people coming up, their heads down and struggling, as we bounced easily along the descent, stopping often to take in the view. 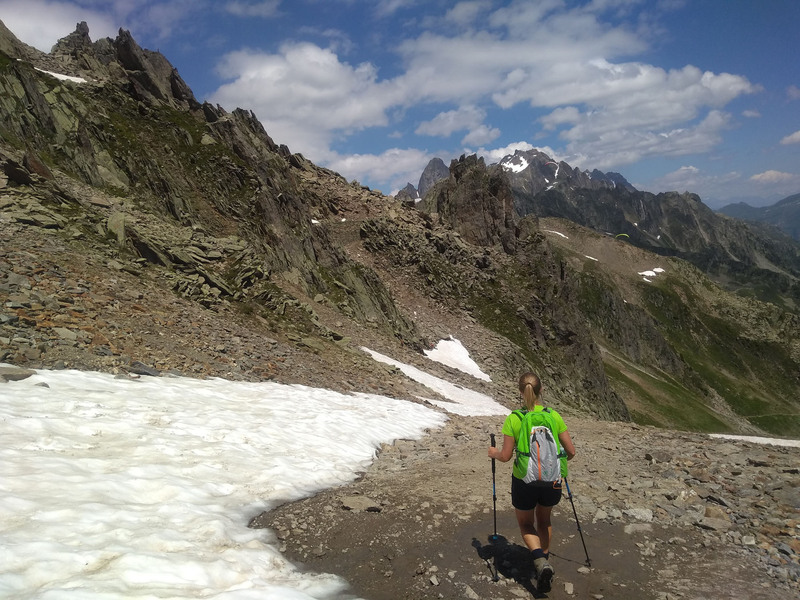 We chatted to a few about the route ahead, and what they had yet to face on approaching the Col. We arrived down at Refuge Elena around 12.30pm, much earlier than we’d expected. We are told we can’t enter our dorm room until 2pm, so instead we order paninis and eat them in the bar, before chilling on a nearby grassy meadow, out of the wind, until 2pm. The dorm was very new with nice bunks, each with enclosed sides and personal storage units, all neatly done and relatively private. We showered and had some lazy downtime with beers to wile away the afternoon. Dinner was served at 7pm, with 5(!) large courses, although that included a rather random apple as a mid-course palette cleanser. We were stuffed from course 2 onward (spaghetti) but with determination and grit we persisted and ate all that was set in front of us. Later we had a quick, breezy walk outside to look at the sky, and then headed off to an early bed. We had another night of poor sleep, courtesy of a noisy, and very smelly, snorer nearby. We reluctantly got up at 6.30am, munched through a simple breakfast at 7, packed and were walking by 7.35am. Against some advice we took the gully rather than the road down from Elena, where we soon encountered three portions of steeply sloping snow that we tentatively crossed using poles for balance. We later heard that someone fell here and had to be rescued by helicopter. From here we dropped to a bubbling river, headed across a small bridge and began the climb back up the opposite side of the valley. 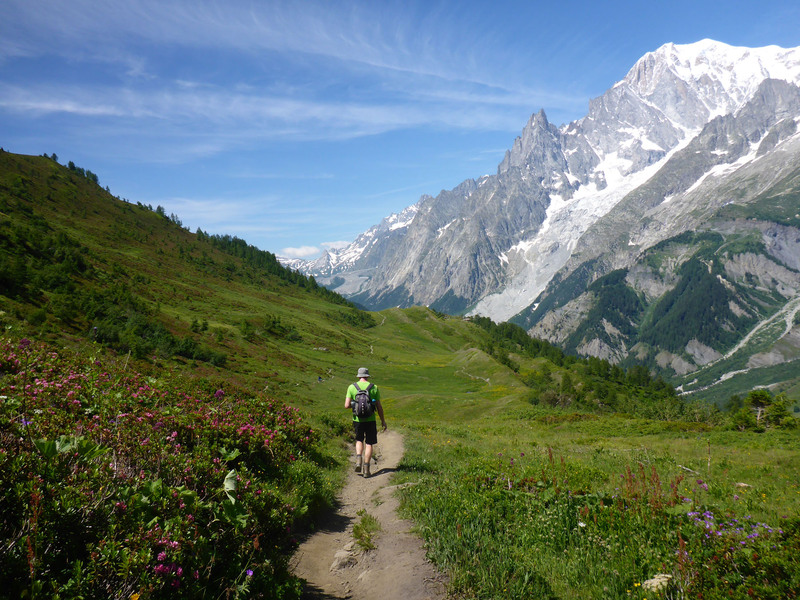 There were stunning views of mountains and glaciers as our path wound up through wildflower meadows and larch forests. 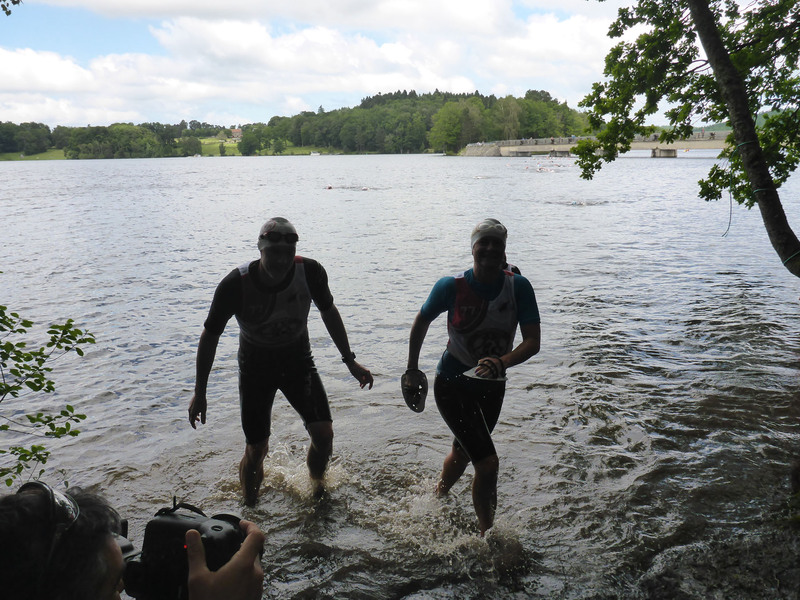 It was a fantastic running trail once it levelled out, and we were passed by smiling groups doing just that. We looked on jealously. 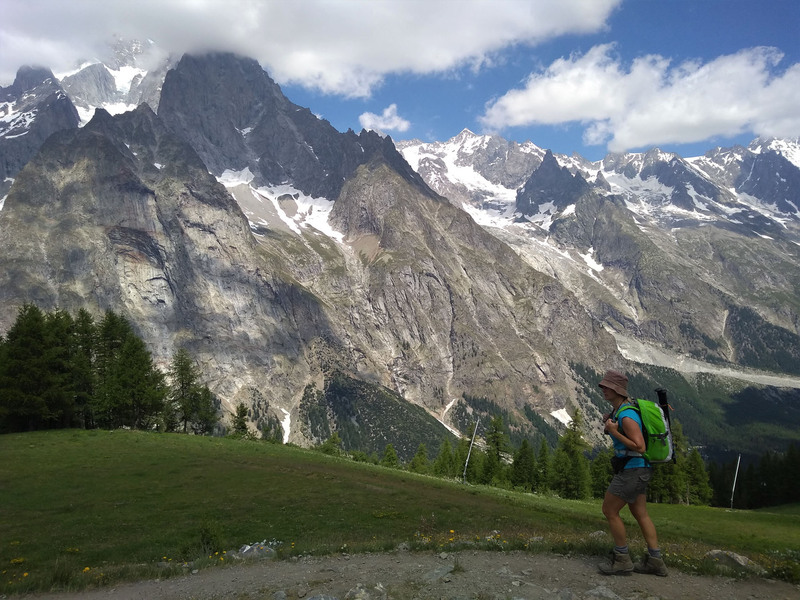 We paused at Refugio Bonatti for an hour to sync my ‘memory-full’ Polar Flow watch so we could continue to track our walk, then we bought sandwiches and pressed on. 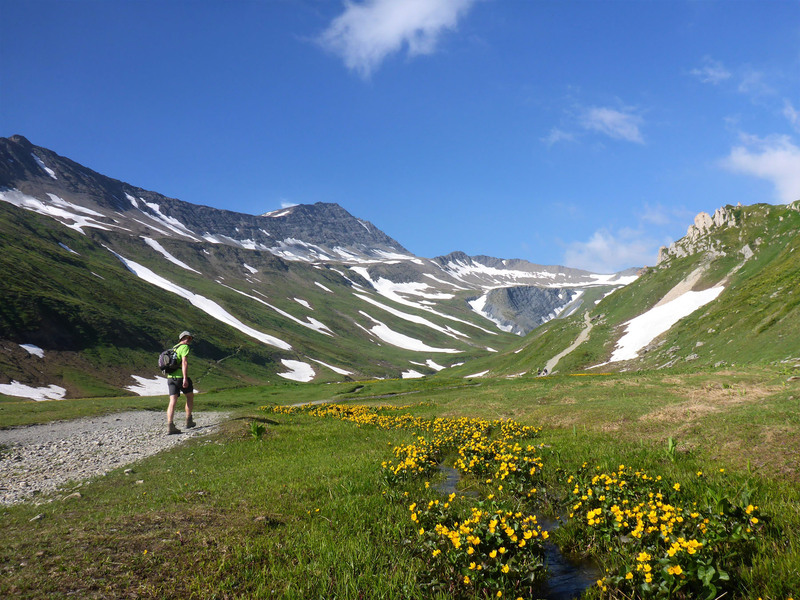 The kilometres passed quickly, us distracted by the fantastic view and pretty alpine flowers. 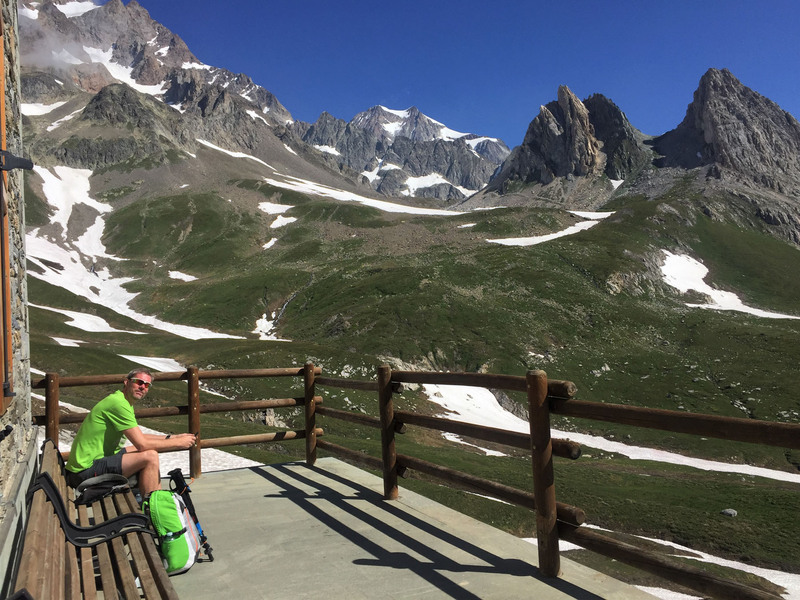 Now in Italy, we stopped for lunch with a view, enjoying the downtime and silence, and just in time as soon after we reached the highest point of the day where large crowds had gathered. 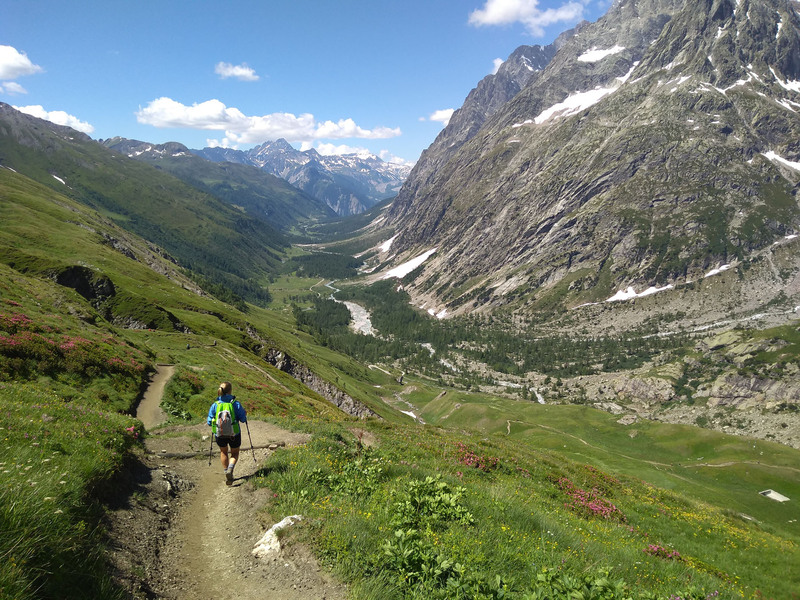 From this pass we dropped steeply down to Refugio Bertone, it also consumed with noisy day-tripping walkers. 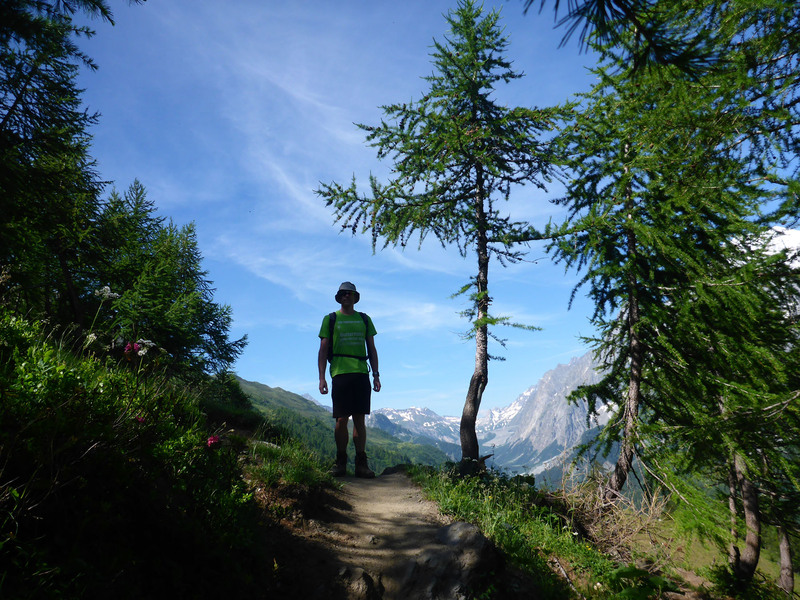 We then descended quickly through dusty forest trails to reach the outskirts of Courmayeur. We passed thickly-cut slated roofs and dark timber buildings as our road arrived into the town centre. We cut through a pretty, manicured park, with many sunbathers and kids playing, to reach Hotel Crampon. We dropped very satisfyingly into our very nice room where we slowly showered, then headed out for a mini-city exploration. 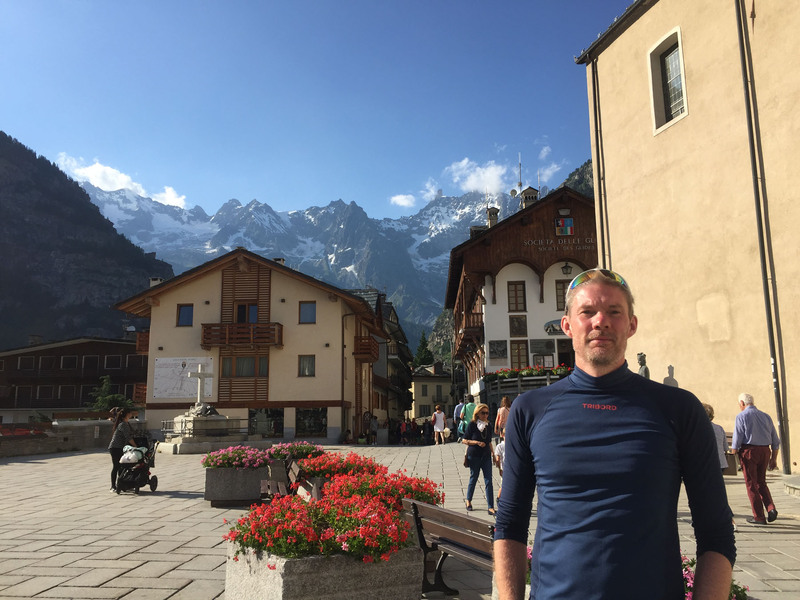 Dinner was not included in the hotel room tonight, so after a lovely walk meandering through Courmayeur centre and all its shops, we sipped chilled beers in small café and sat people-watching. Afterwards, we enjoyed some lovely pizza and red wine in a nearby restaurant, then back to our room for packing before sleep. We sat our alarm for 7.30am, but even in a lovely double room we had a night of poor sleep again. Just after the alarm our room phone rang to tell us our bag-lift is here early. Frantic packing ensued. We got organised and dropped off our bag, then returned back down to find a very yummy Italian breakfast, complete with several cake options. 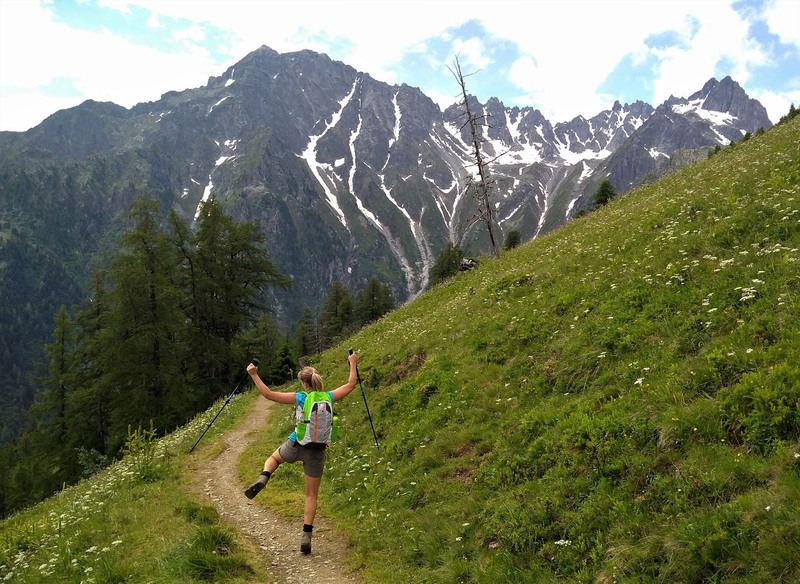 Full to brimming with breakfast cake, we plodded uphill through silent Courmayeur villages then faced a very hard trek up steep shady forest trails for over 3km, working very hard and dripping wet with sweat. 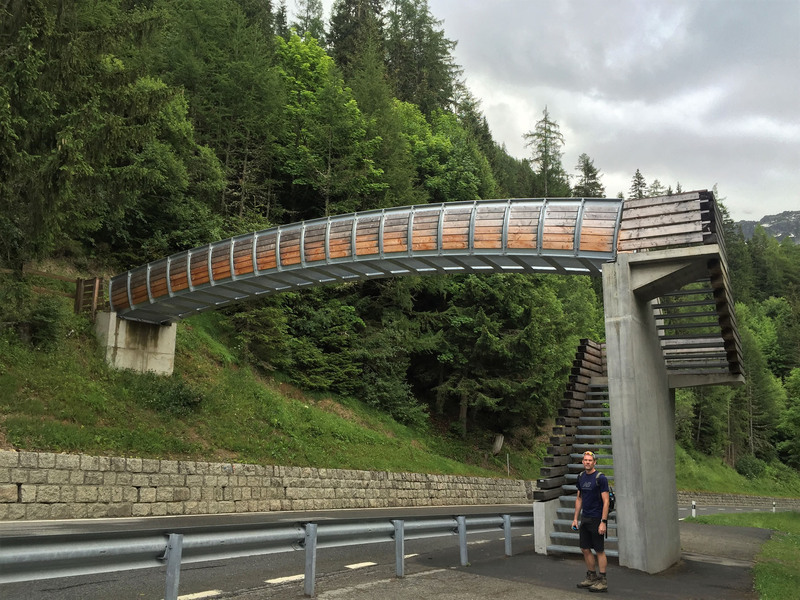 The path wound its way under a working gondola lift and we wondered what the smug customers must be thinking of us, struggling up under them as they rode up the mountain in comfort. 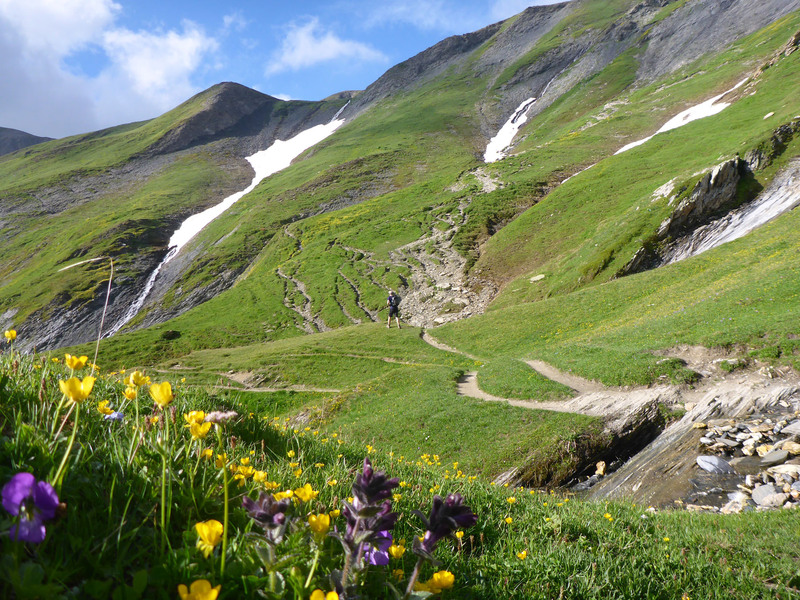 The path finally opened out to flowery meadows that formed an expansive, recognisable ski area with multiple lifts dotted about. 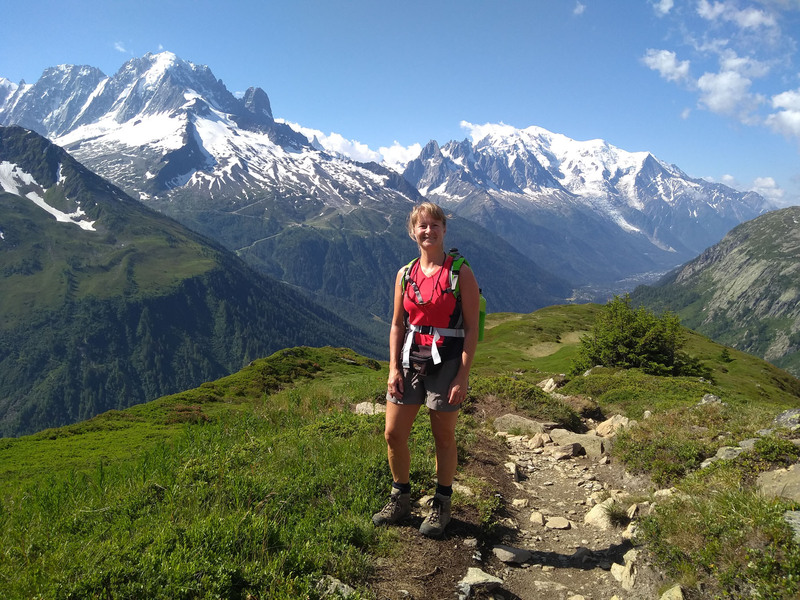 We refilled our water at the restaurant on Col de Checroit before beginning a long, manageable uphill trek with great views of the Mont Blanc Massif, replete with glaciers. 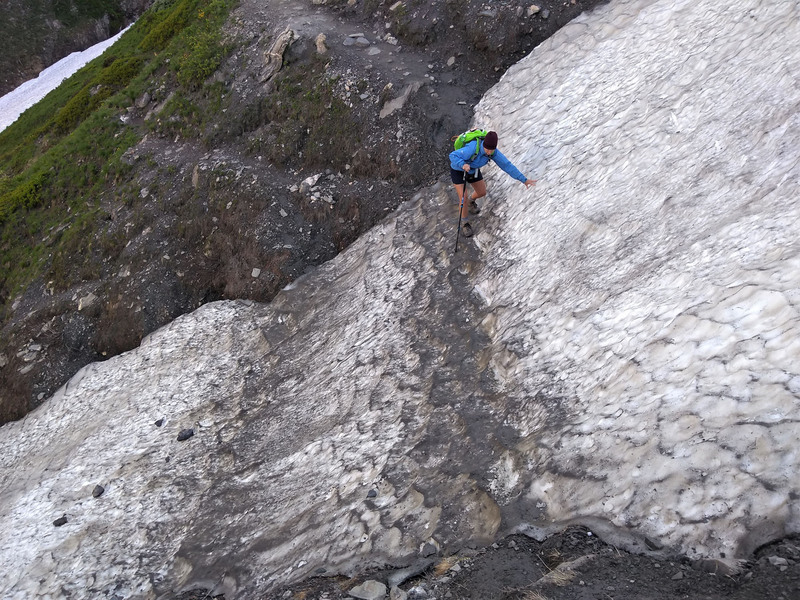 Nearing the top of the Col, we had to cross several patches of snow to progress. We passed large groups of students near here, and other campers resting in hammocks. 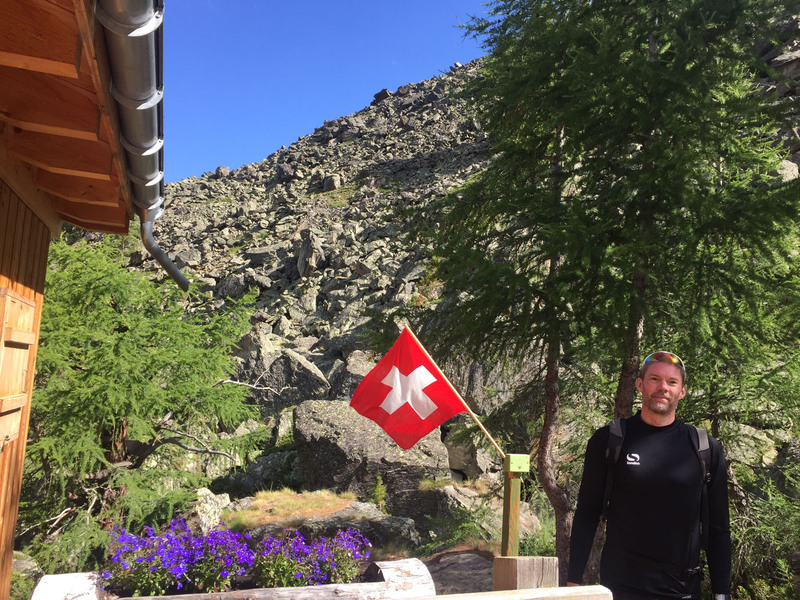 We finally passed the highest point of today at 2434m, where we met Colorado resident Sam and chatted about our lives on the descent. He was trekking alone and camping wild, a very different and personal experience than what we were doing. He was also excited to hear about the ease of motor-homing life in France. 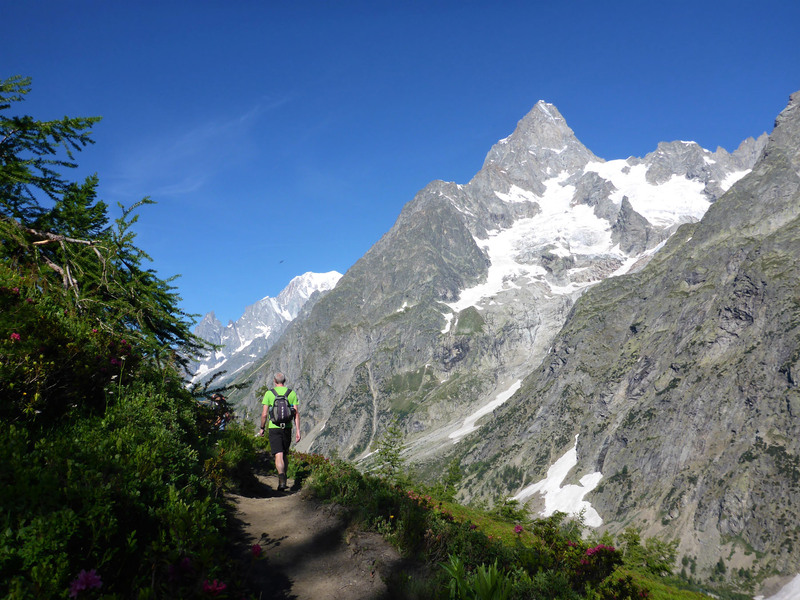 We parted ways at a small junction towards to Cabane du Combal as Sam continued on around the TMB route. 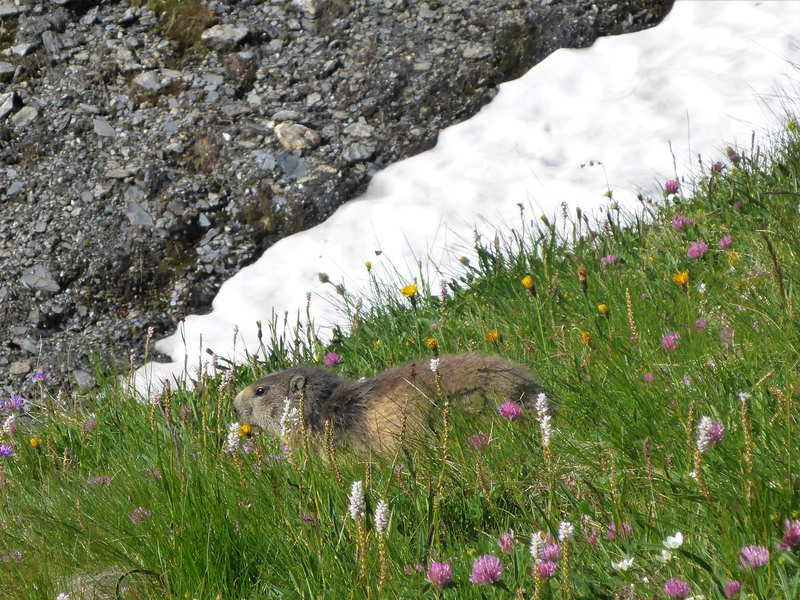 We spotted marmots on the slopes, then later two young ibex feeding just outside the cabane. 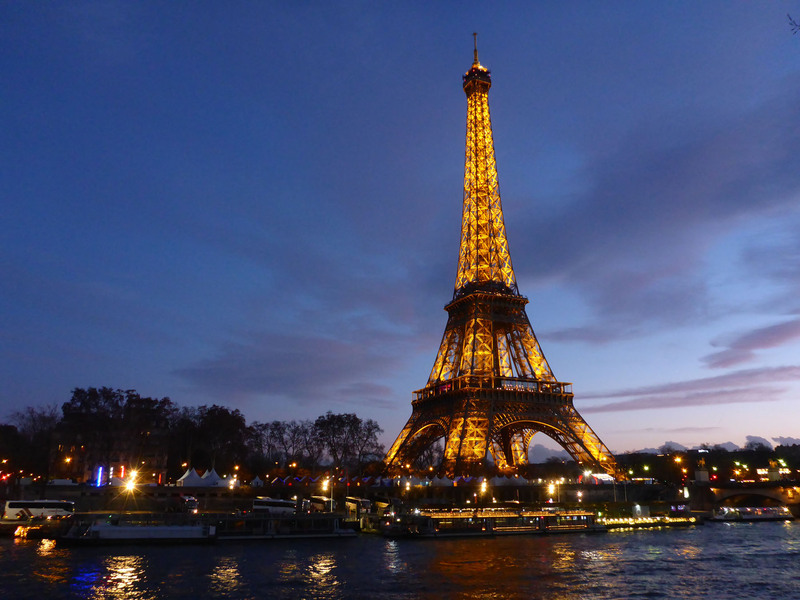 We checked in, this time in a 3-bed room shared with a French gentleman called Thierry. 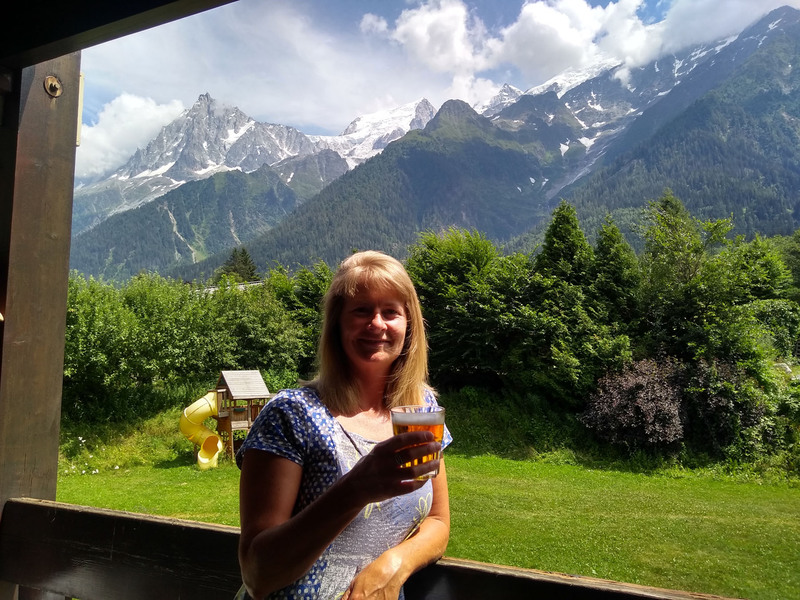 We walked up a local climb in our flip-flops, to view a glacial lake and enjoyed the vista down the expansive valley, then enjoyed several beers in the sun as we awaited dinner. 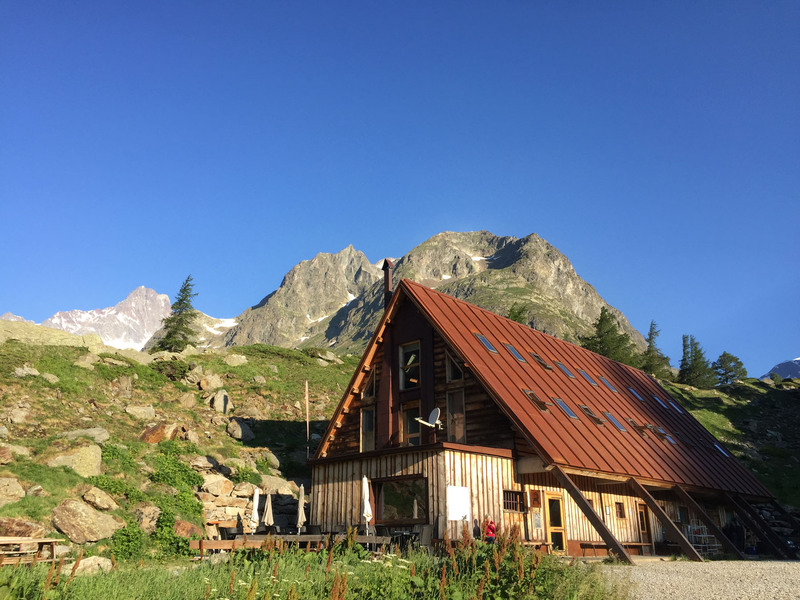 Dinner in the cabane was terrible, our first poor food experience on the hike. We spent a reasonable night in our shared room, then up for a very basic breakfast of bread and jam, but still better than the slop served at dinner. 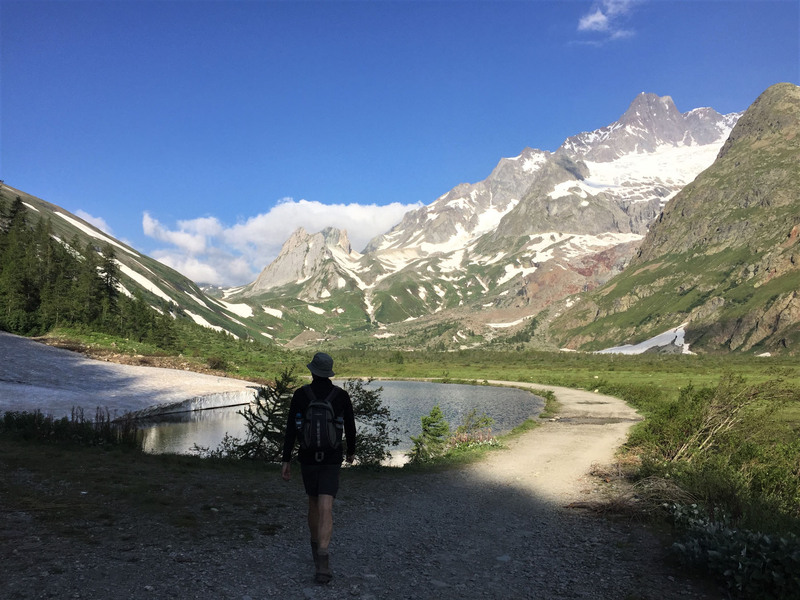 We were packed and gone by 8am, along an easy gravel road heading to Refugio Elisabetta and beyond, climbing slowly up to the Old Italian Customs House, set just before the French border. We saw lots more marmots on the path, them either lethargic or unafraid. We enjoyed some time with the nice Italian museum curator, learning about local wildlife, flora and fauna. 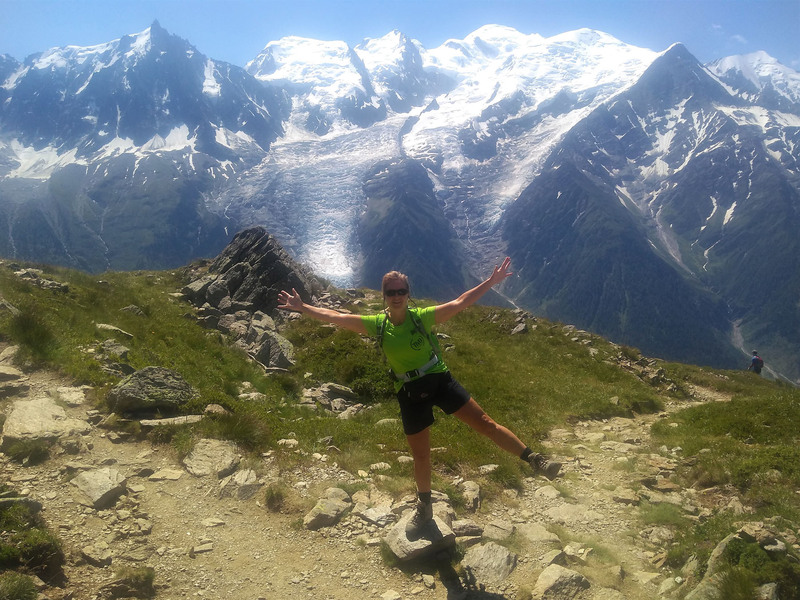 We then continued up to Col de la Seigne, finding the cairn area packed with people enjoying the expansive views. 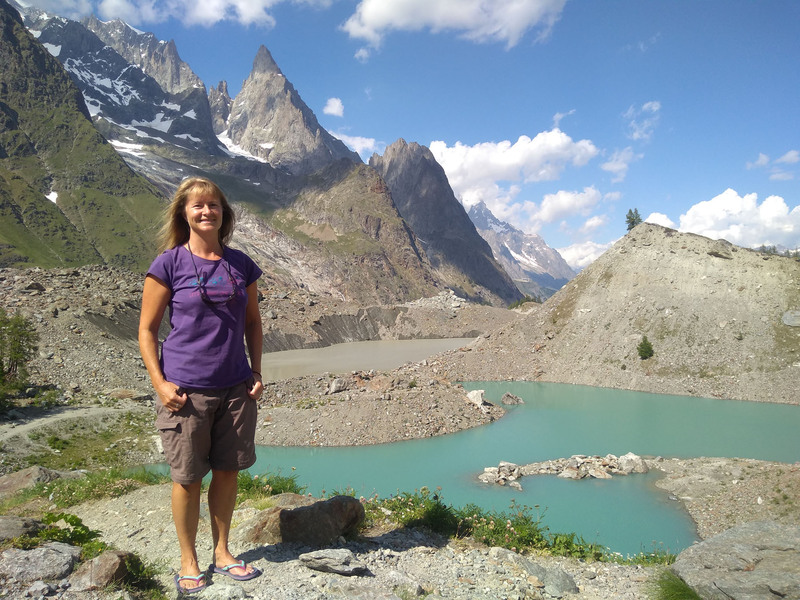 We crossed back into France and stopped for a quick lunch with yet another spectacular view. 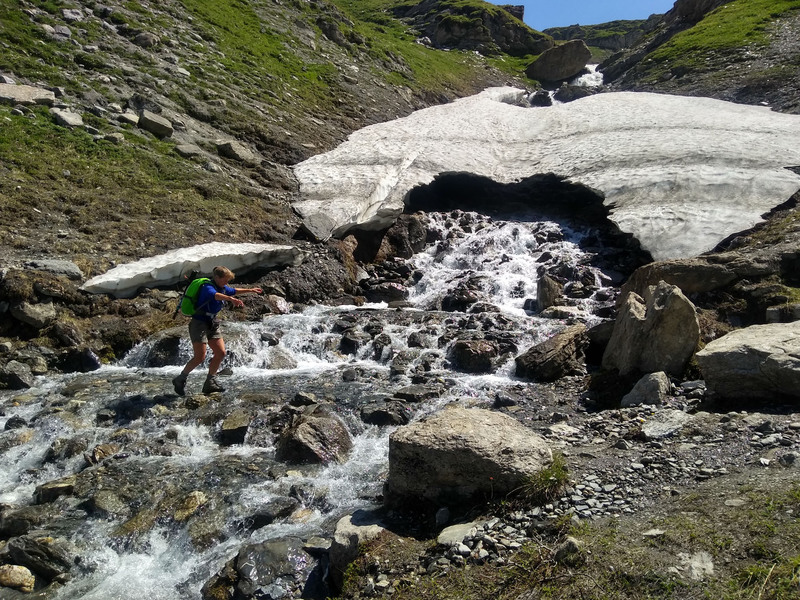 There were several more snow crossings on this side of the Col too, and one specific one we chose to ignore and forded the river instead as the snow bridge looked very thin and weak. 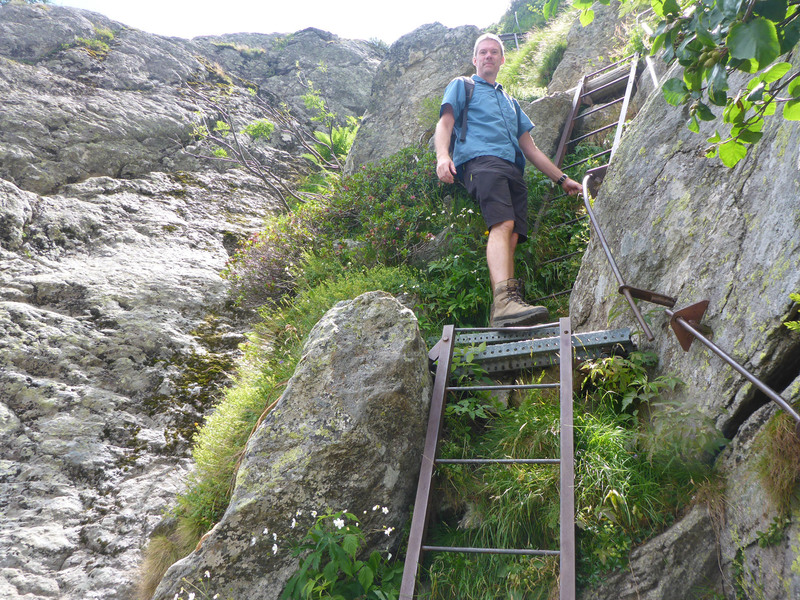 From here, we had an easy downhill following hairpins on dirt paths, to reach our accommodation at Refuge Les Mottets. No check-in until 2.30pm, so we very naughtily enjoyed a carafe of wine on deckchairs in a nearby meadow, with horses and donkeys for company, as we waited. It was very sunny or chilly depending on the changeable clouds. We slowly drunk our litre of red before checking-in, a little squiffy. We had a very nice double room, well away from the terrible dorm rooms that were just lines of beds, touching side by side, 32 to a room. We snoozed part of the afternoon then attacked our 5-course dinner with gusto. 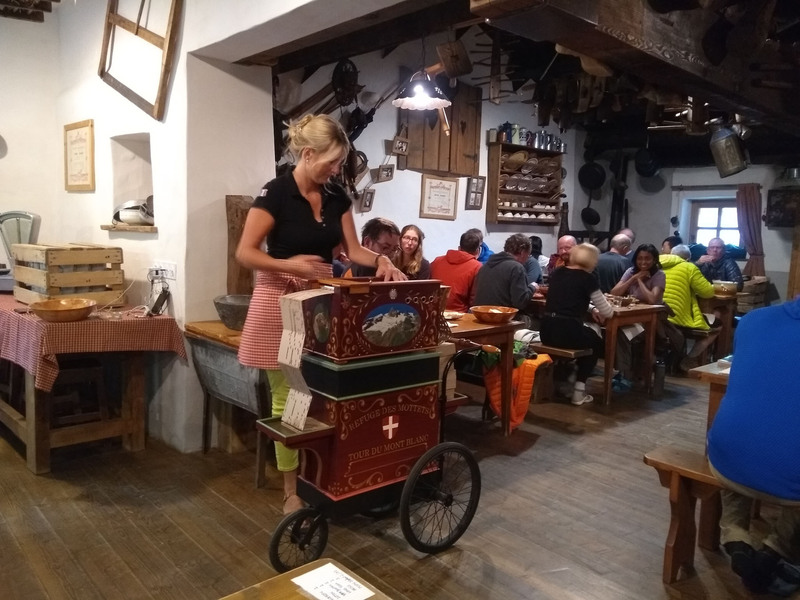 We enjoyed the food with an accompaniment of traditional and pop music tunes on an organ-grinder turned by our host. Annoyingly, even in our double room we had poor sleep, caused by doors slamming most of the night. We both wrote a detailed suggestion note to the refuge to ensure they adjust all the door closers to stop the doors from slamming so loudly, or at least add signs to tell people to be aware. 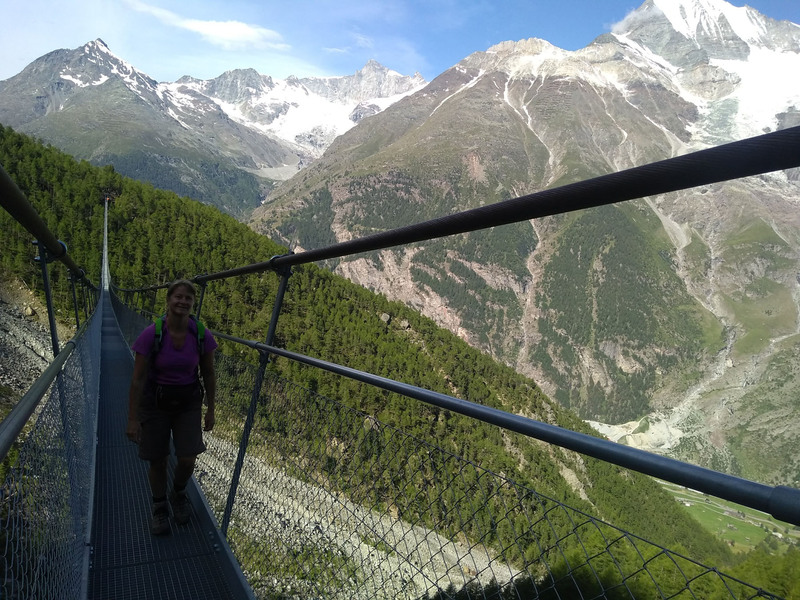 This entry was posted in 2018 Summer Tour, France, Hiking, In France, In Italy, In Switzerland, Italy, Our Travel Journal, Switzerland and tagged Alpine, alps, Circular route, France, Hiking, Italy, mountains, Multi-day walking, nature, photography, sports, Switzerland, TMB, Tour du Mont Blanc, travel, vistas on Jul 25, 2018 by Aaron Hill. 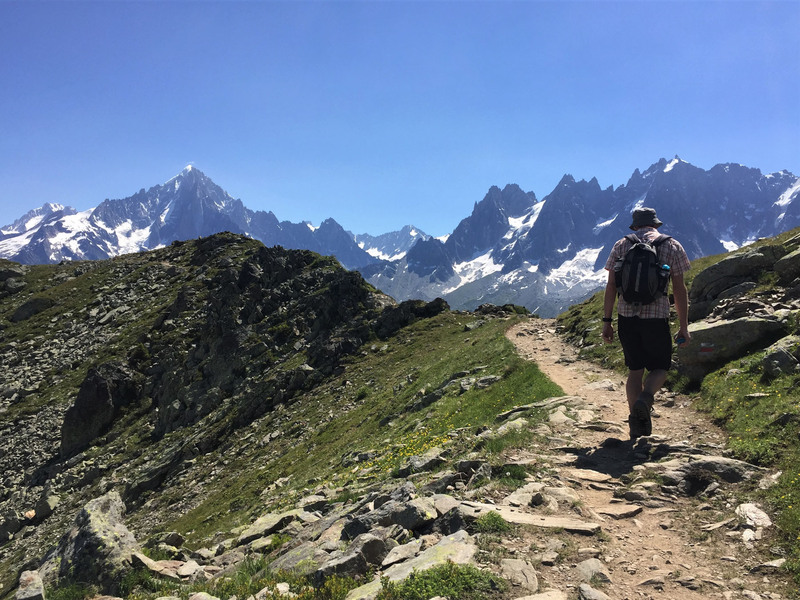 Disclaimer: We are finding it difficult to find a way to encapsulate the highs and lows, physically and emotionally, of the overall experience of hiking the Tour du Mont Blanc circuit, so the following three posts are more of a simplified, chronological walk around the loop with us. We will likely revisit this hike and write a more reflective, compelling post in weeks to come, but for now we will let a simple description, alongside our many vivid photographs, reflect on our days. 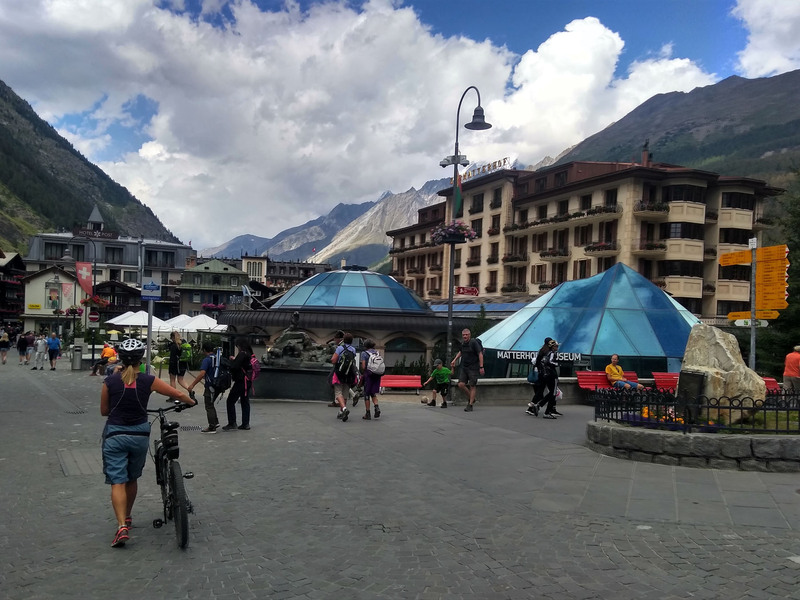 We started from our tiny campsite Le Grand Champ under cloudy skies and walked along the empty road to catch a free bus into Chamonix centre. From here we had a steep path up to reach Plan Praz lift, the top of which would form the true start of our TMB hiking loop. We arrived and started hesitantly, following the Balcon Sud traversing north east around the slopes, through an expanse of fir trees. We passed large stone walls, snow breaks we guessed, with wide spaces between. It became a busy path with many people on the trail, the majority of them coming towards us. 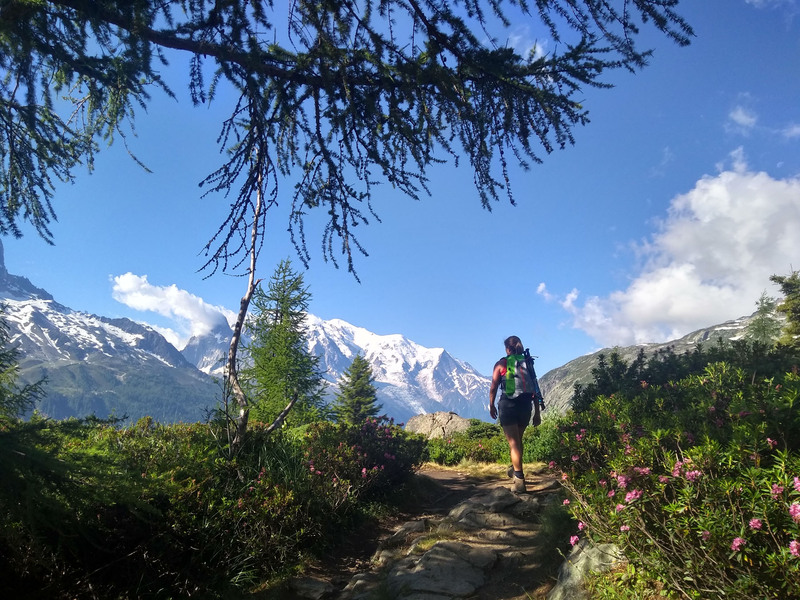 After a few hours, we took an optional variant route to visit Lac Blanc, adding 45 mins to our day, but more beautiful scenery. 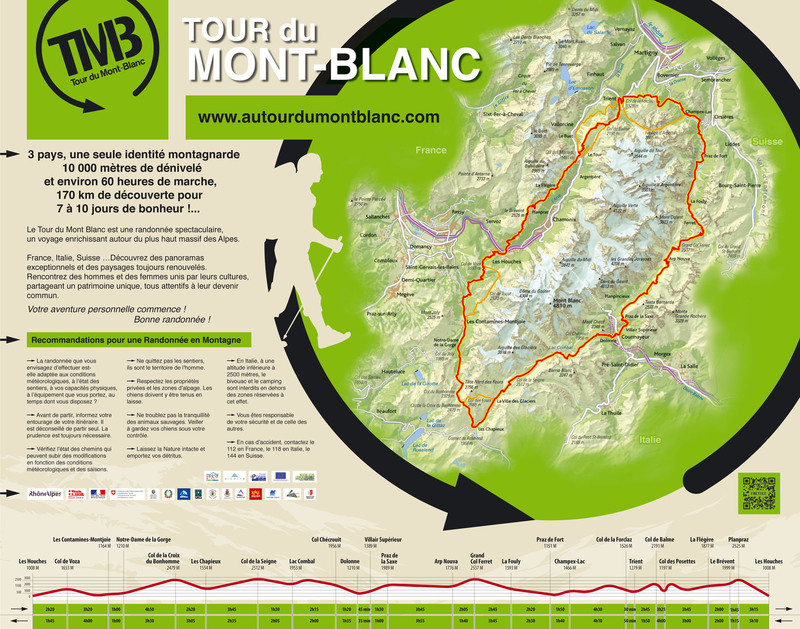 It was a tough climb, with many day walkers from Chamonix adding to the numbers. 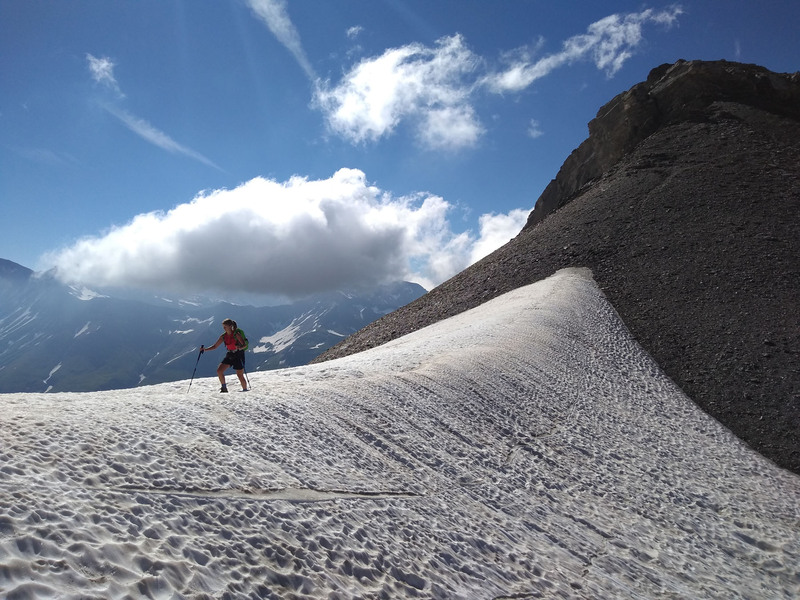 It was slow going as we faced large stepped boulders to climb and bodies to navigate past as we inched our way upwards towards the plateau with the White Lake. There were occasional small snow fields here, but all well-trodden and easy to cross. It was a slow, hard climb to reach the lake where we paused for lunch. 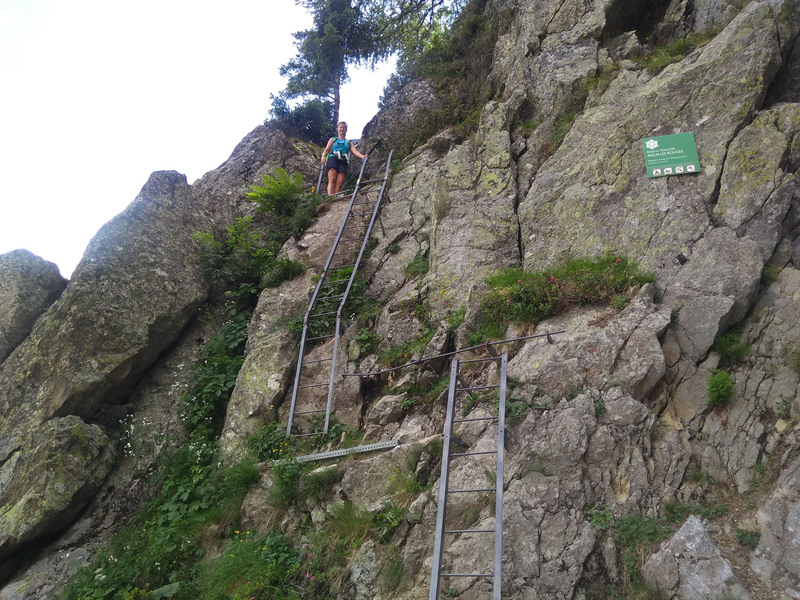 We then followed a long path down, passing by another beautiful mountain lake, to find a run of vertical ladders and handrails with the feel of a via ferretta. 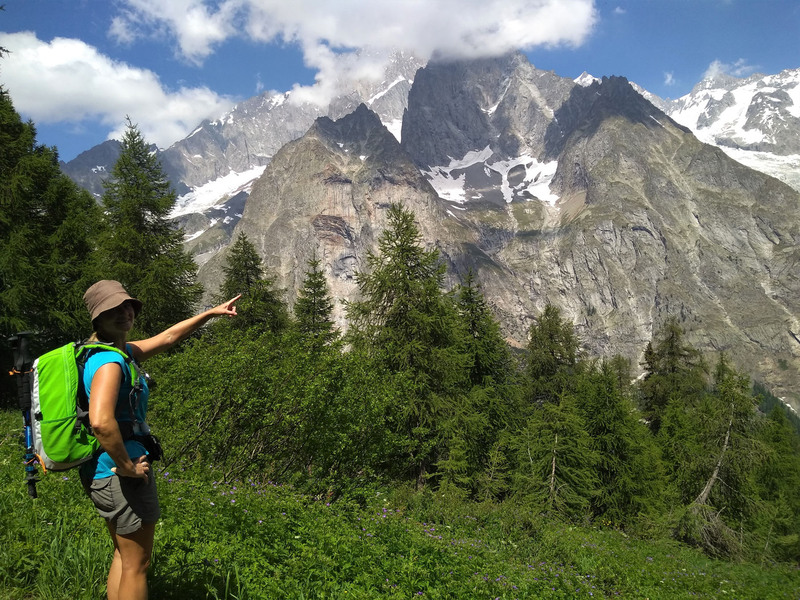 We watched climbers play on a tall needle rock as we descended the ladders, then we took the wrong route down through a deep forest, a lovely but steep trail signposted to Argentières. 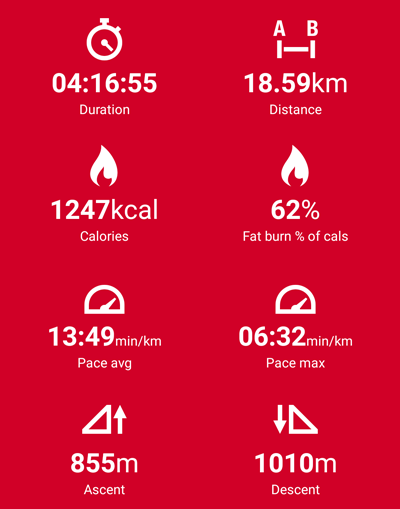 We ran out of water 30 mins from end, having carried over 3 litres but having found nowhere to replenish them, on this sticky hot and rather draining day. 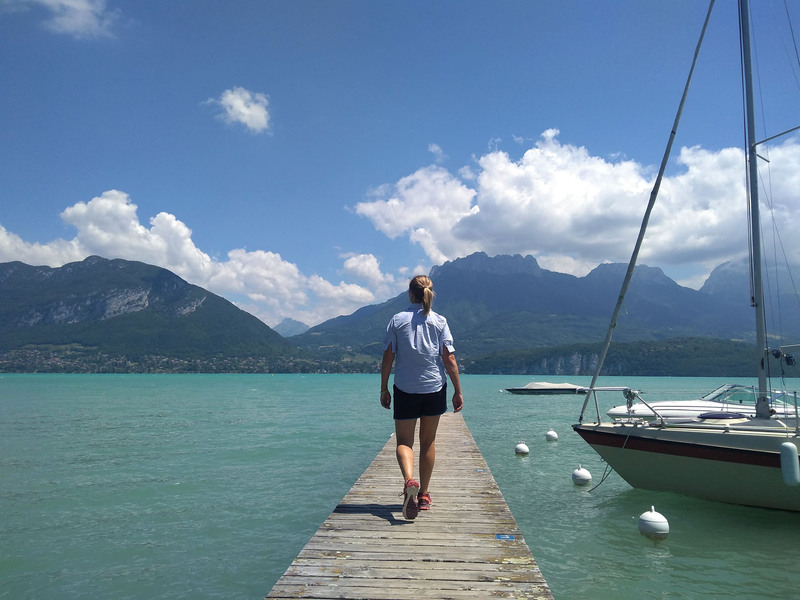 We finally popped out in Argentières 50m from our hotel, La Couronne, and were quickly gifted a lovely room with a bath – a perfect way to relax with the beers and snacks soon collected from the nearby supermarket. 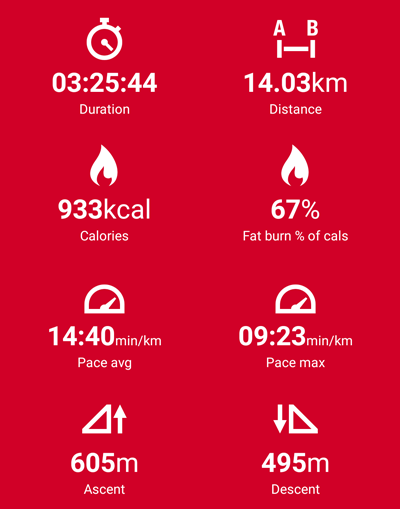 This, our first day, was much harder than expected, and we both had sore legs. We began to worry that our hiking fitness was not fully what we had expected. 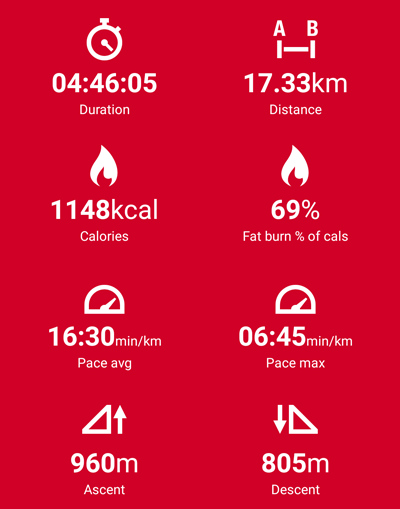 This was classed as an easy day on paper, so we were apprehensive over what was to come. 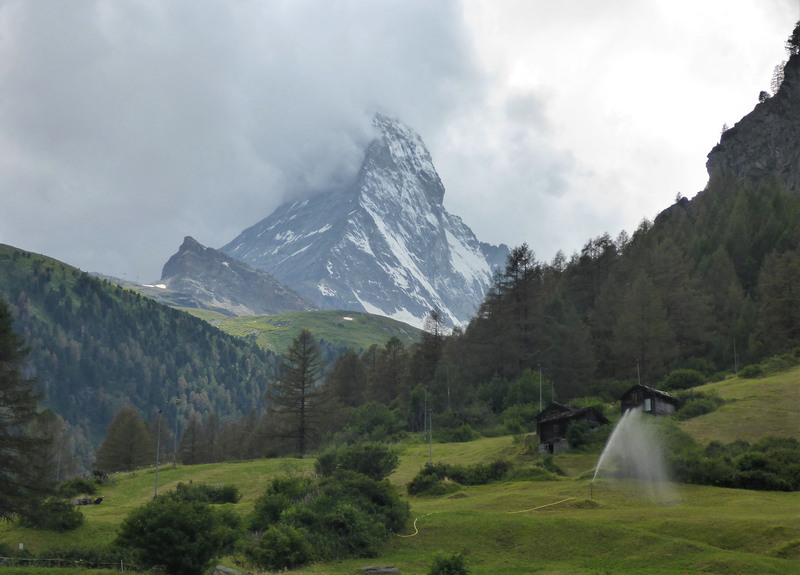 There was heavy rain overnight, wild storms that were fun to watch, but it was dry once we began walking. After a filling 7am breakfast we were packed up and ready by 8am. 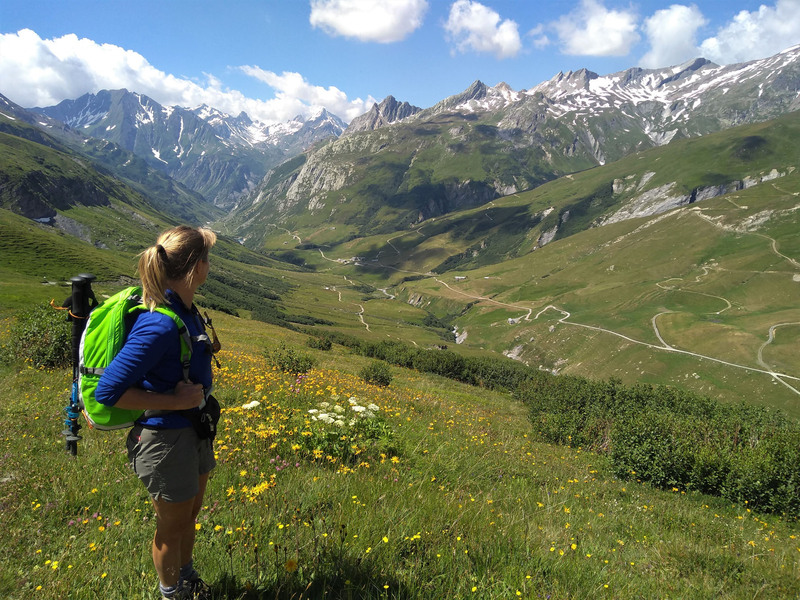 We headed steeply uphill out of town, found our route and rose quickly through the treeline, passing several campsites with multiple colourful tents. 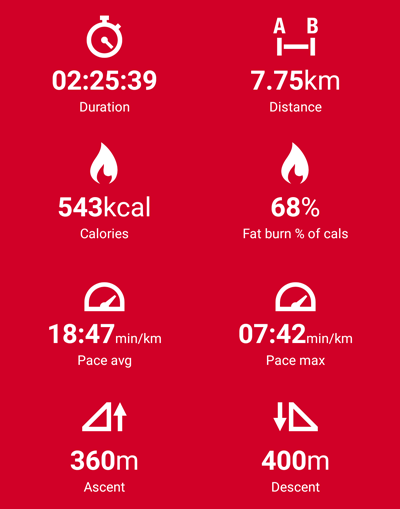 The path was generally easy underfoot, pine needles and tree roots, but with a solid, consistently steep ascent for over two hours. 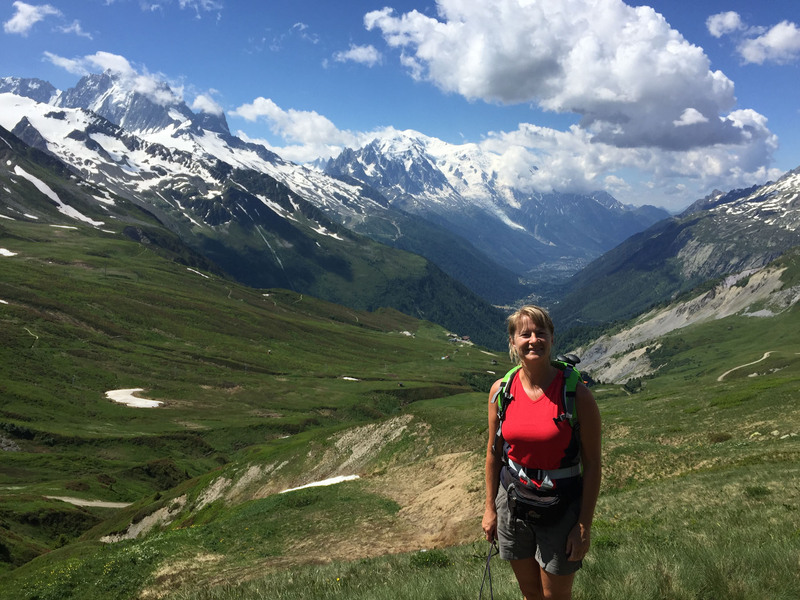 We were rewarded with breath-taking views of the Mont Blanc Massif behind us, and stopped often to gaze at it in wonder. 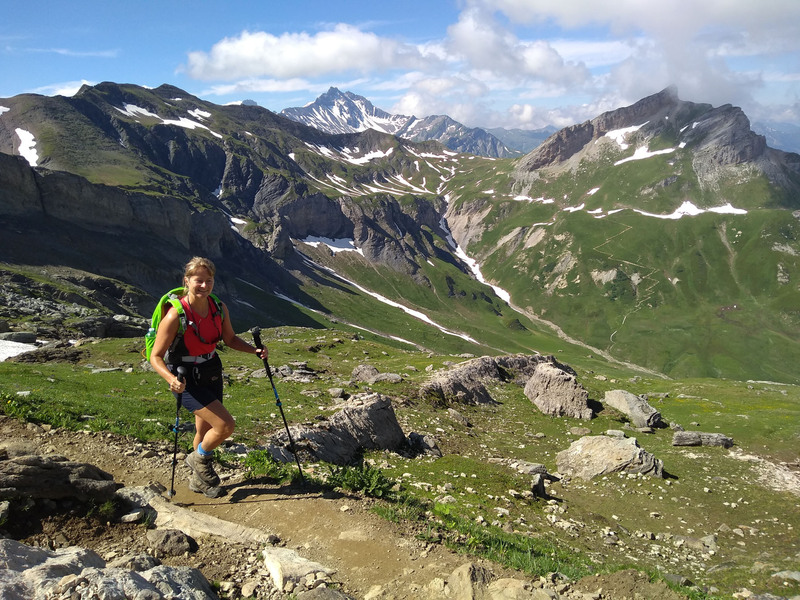 We followed the l’Aiguilette de Possette ridge up to 2209m, a beautiful, rolling path with views to both sides, before dropping down into Switzerland, then rising again to reach Col des Balmes. We paused at an old mountain cabin with a small shop inside, busy with trekkers as a key point on route. 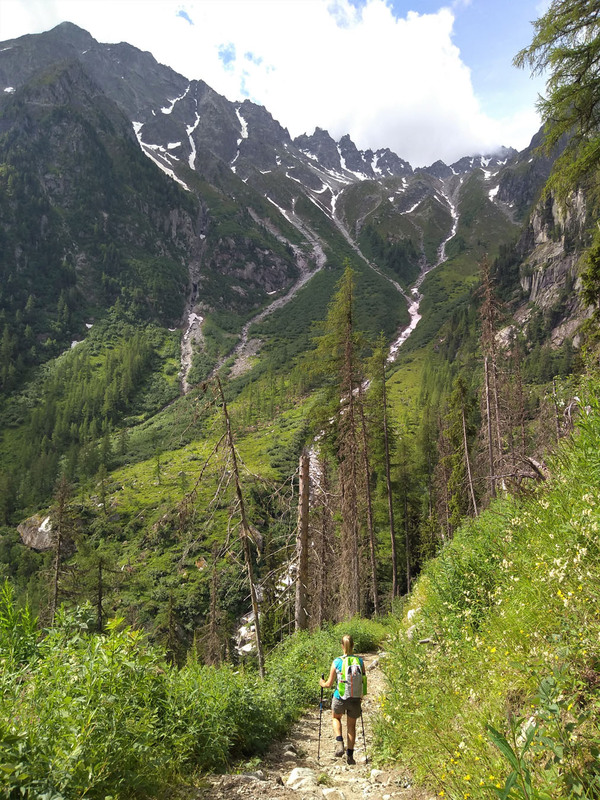 Beyond us we could see lots of winding, dusty downhill paths with grunting and desperate people, heads down and making their way up in what looked like misery. We bounced down, an easy path in this direction, really a wide gravel track at this point. We passed four hardy bikers heroically cycling up this path on fat bikes, and soon after found the lower part of their route had been very steep, rutted with roots and stones. 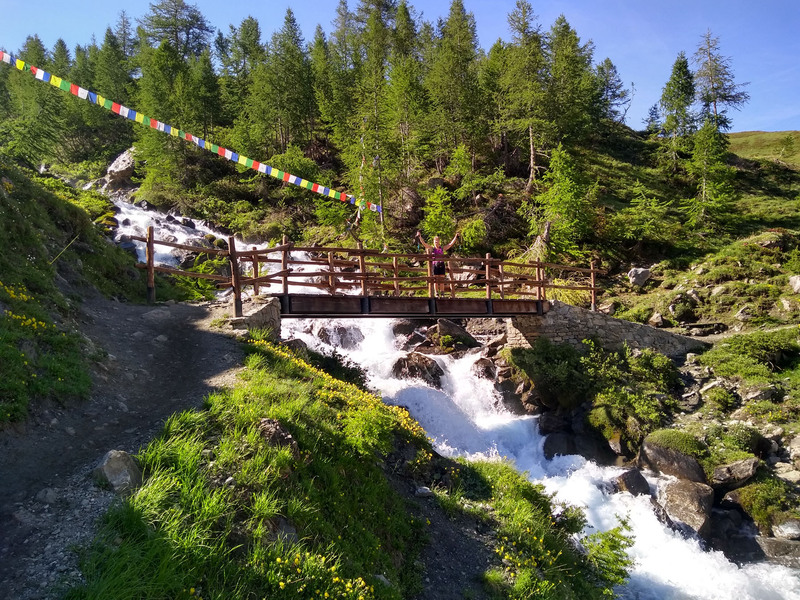 We had a long, monotonous drop to reach the valley floor, losing 1000m of height, but with the sound of cowbells and flowering meadows around, fulfilling the required Swiss stereotype. 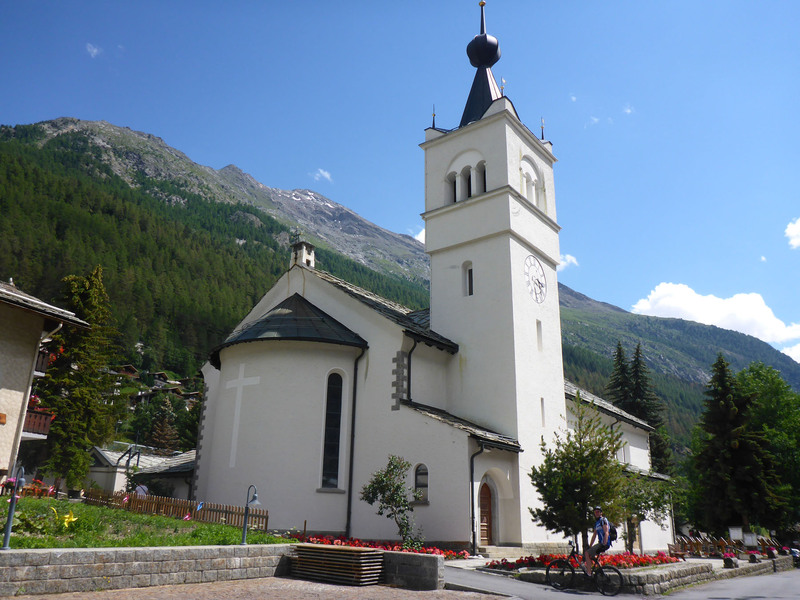 We crossed two lightly-flowing rivers and then walked the length of Trient, passing a bright Pink Church, to reach Hotel La Grand Ourse. We were unavoidably in a dorm room here, with eight beds. There was no shop in town, but a small bar in the hotel. We discovered that even with my sunhat on and 50+ cream I still got rather burnt today., but at least there was no sign of the snow we had been told we would need mini-spikes to cross. 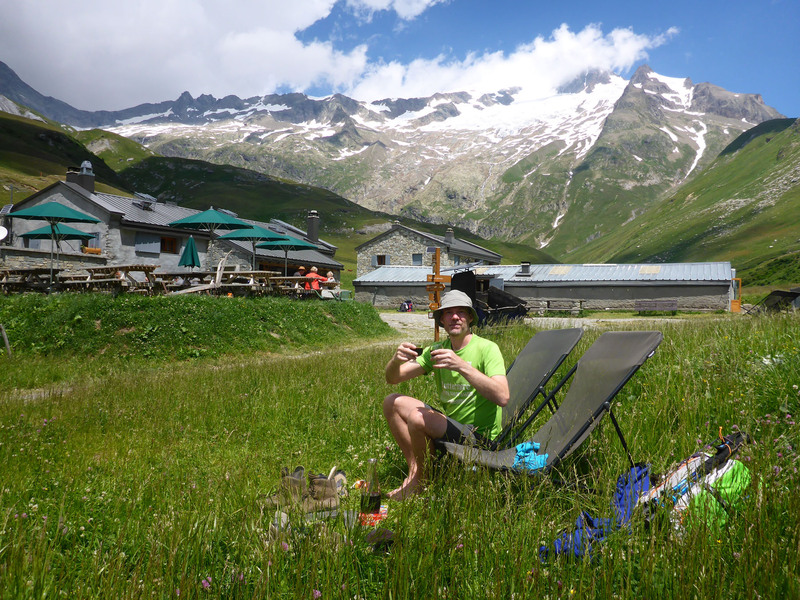 We enjoyed some slow beers at 5pm chatting to a US couple hiking as a family of four. We had a loud, communal dinner at 7, like a Harry Potter feast, where we chatted lots, then everyone was suddenly off for an early bed. We had a poor night’s sleep in our dorm, due to loud snoring by someone. We were then rudely awoken very early, by a 5.45am alarm set by one of our roomies. At 7am we faced a free-for-all scramble at breakfast, then, to escape the madness, begin walking by 7.35am. 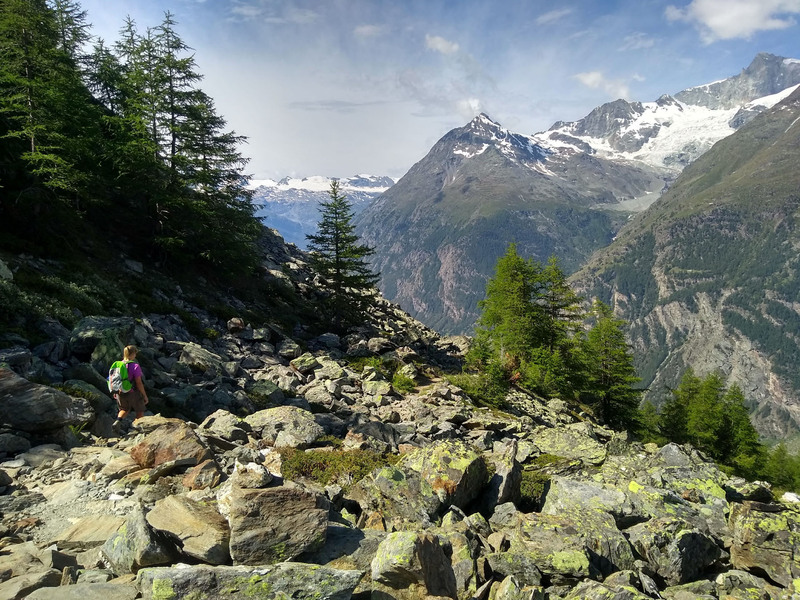 We headed back uphill through dense forests, a quiet trail passing lots of tents, to reach the shops at La Forclaz col, where we looked around but bought nothing. 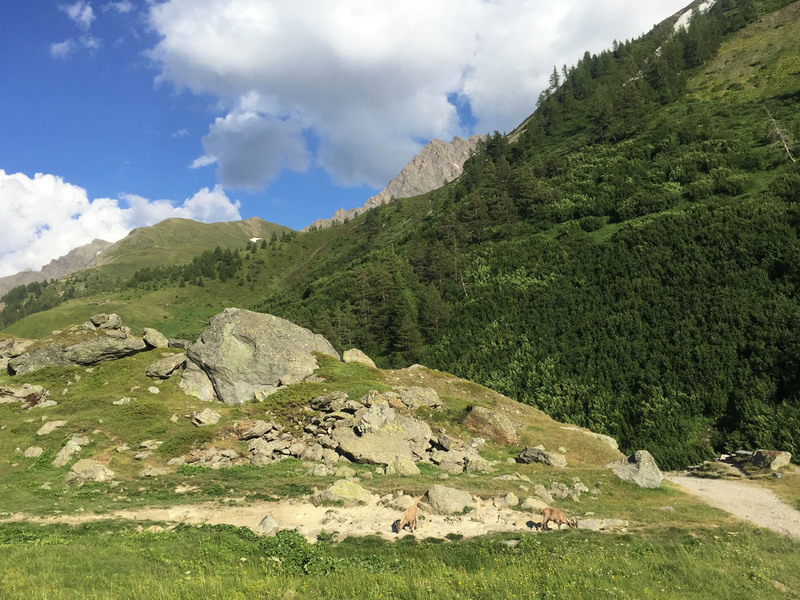 We refilled our water bottles here, then followed an easy path that levelled out, allowing a striding pace, with steep meadows falling away on our left. We faced more long rises on smooth stone and dirt paths to reach the top of today’s main climb, Bovine. 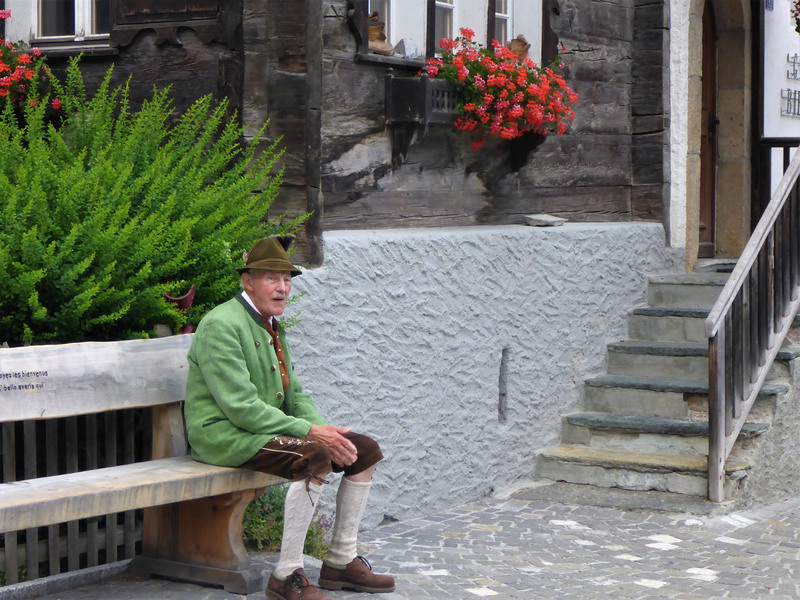 There were flowering Swiss meadows with noisy cow bells everywhere. 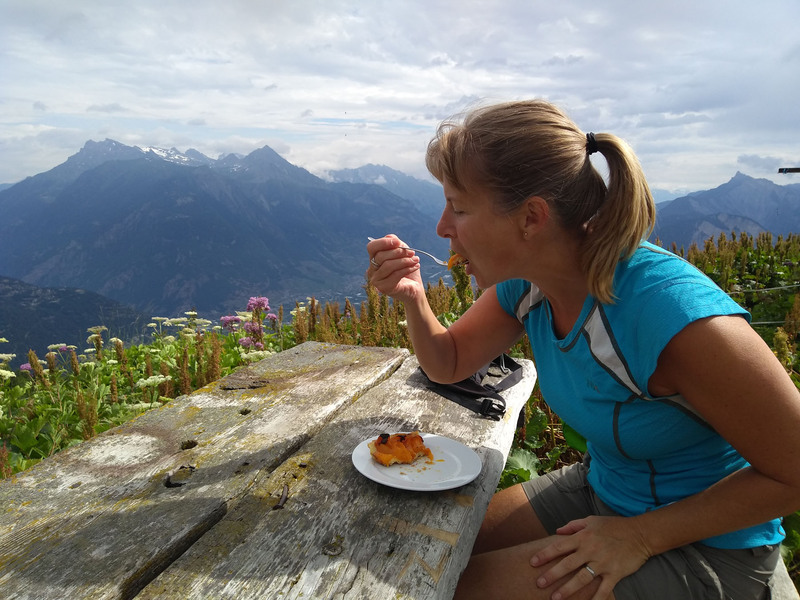 We met an Aussie couple at the top of the Col and again at Bovine café where we enjoyed a slice of apricot pie. Our path ahead was blocked by resting cows, so we took an alternative route behind the café through patches of nettles to avoid them. From here we followed a long, easy drop downhill, meeting hundreds of fellow walkers struggling up the persistent route. As we dropped, we passed spectacular snowy peaks with waterfalls and rivers running down their face. We felt a little smug as we easily dropped down as others struggled up. We crossed several rivers, much easier than had been suggested to us, and finally broke out of the tree-line onto a flat path about 90 minutes later, still meeting others only now starting up the climb to the Col. We followed a long easy road into Champex, a flat fire track through thick fir forests. It began to rain as we approached the centre of town, so we nipped into what turned out to be a very expensive supermarket for a few lunch items, before getting decently soaked as we made our way to Hotel Splendide. We passed by a large lake with some hardy fishermen braving the heavy rains to catch their dinner. We were checked in by 1pm, enjoying the great view from our lovely double room with a balcony, so glad not to be in a dorm again. We ate our supermarket lunch and showered, then relaxed and snoozed all through the afternoon. Our luggage arrived later, then we dressed up for dinner at 8, which proved to be a rather posh affair with four courses. After heavy rains all through the night, we decided on a leisurely start, enjoying a lovely breakfast at 8.30am. We then left to begin walking dressed in waterproof jackets due to the light but persistent morning rain, but with shorts on as still quite warm. We had a damp walk downhill through a neatly forested area filled with many carved wooden statues of mushrooms and various woodland animals; a treasure-trove of curiosities. From here it was mostly low-level walking through quaint, ancient villages – we passed wheat drying barns with traditional timber-work and stone-plinthed hay barns. 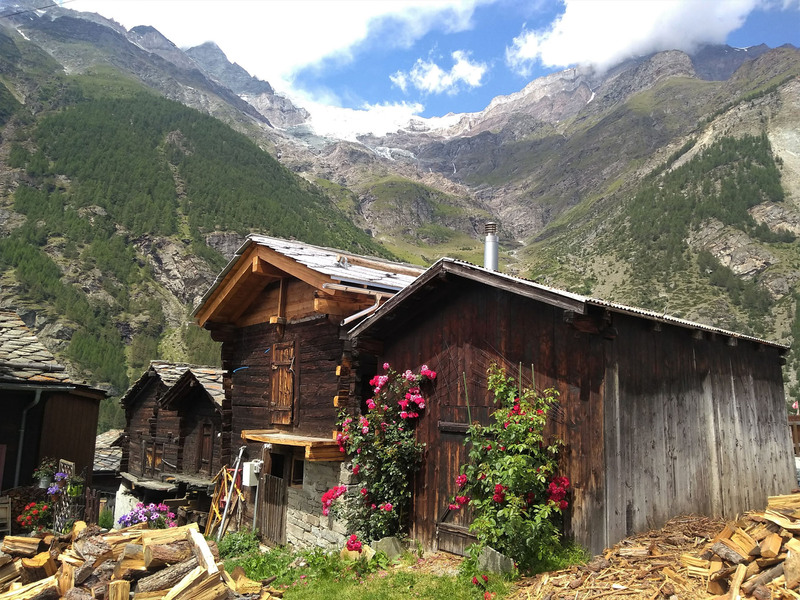 It was all easy walking on rolling paths through the valley, no big climbs or big mountain views, but lots of interesting chalet houses and pretty meadows. There were gnomes galore at one over-decorated home. 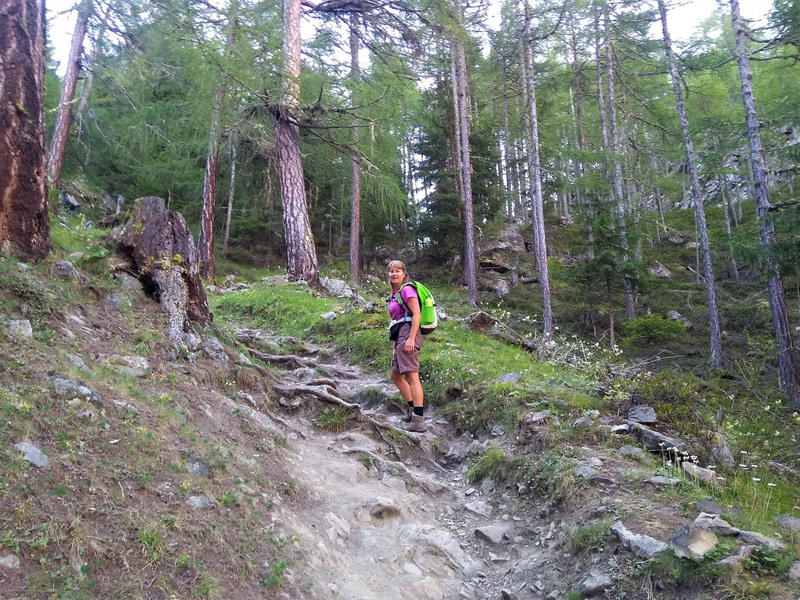 We later faced a few short woodland climbs, but nothing strenuous in comparison to previous days. We passed a huge dry riverbed with massive boulders strewn around that must be entirely wild when in full flood. 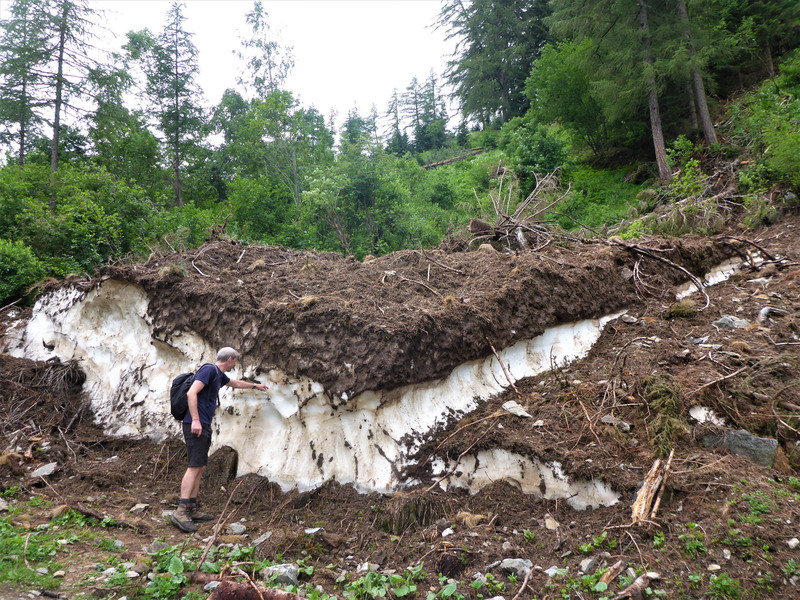 We also found a patch of deep, icy snow, kept insulated with a coating of landslide soil, solidly unmelted. We then passed a tall waterfall, admiring it from a distance, as we approached La Fouly. 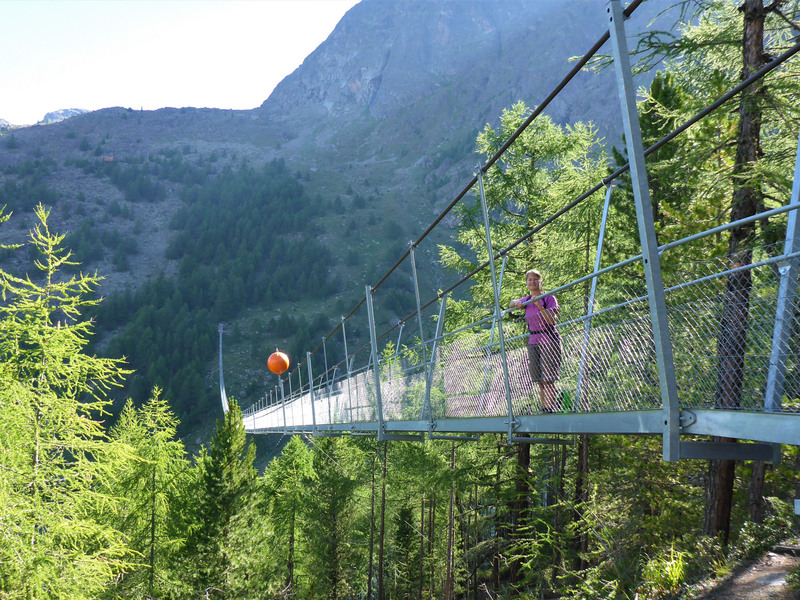 We passed a large campsite with climbing walls and tree-top walkways and a dam with raging water control to enter the village of La Fouly. 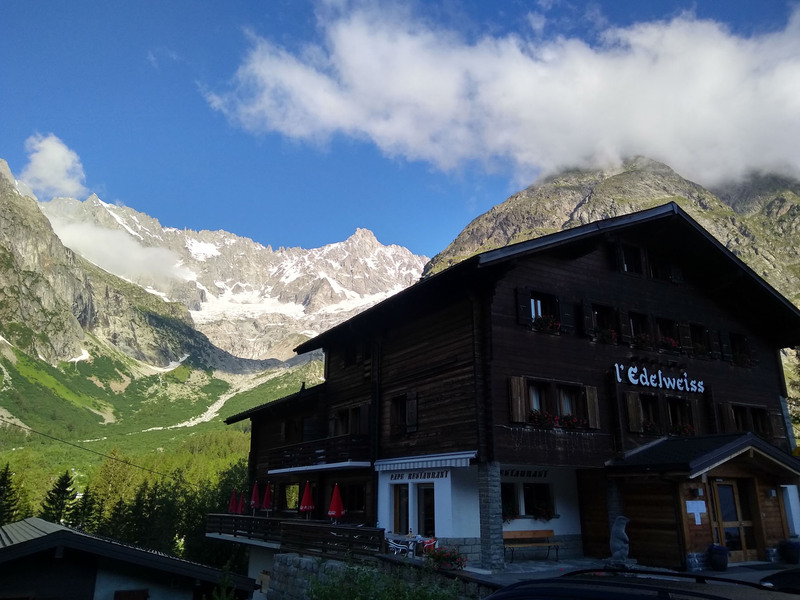 Hotel Edelweiss was not yet ready for us to check in, so we went for another short walk, completed a small supermarket shop and ate lunch before checking-in. Low cloud darkened the valley, hiding the surrounding mountains, but we could see La Fouly would be a beautiful place if the weather would only allow us to see it. We spent a lazy afternoon with a bottle of red, watching Wimbledon in our room, then had an early dinner beside an interesting English couple from Canterbury who were walking the TMB the opposite direction to us. We later watched Brazil vs Belgium in the World Cup quarters, then chilled in our room, glad of the restful downtime. We could hear a noisy set-up was happening outside for the grand start of an Ultra-marathon race in the morning. This had definitely been the best day for us to have had poor weather and visibility, safely away from the big views. 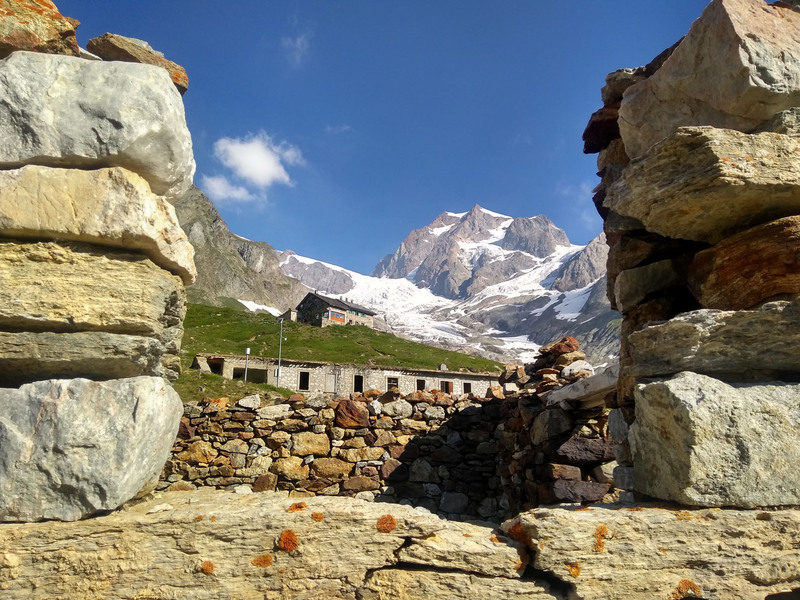 This entry was posted in 2018 Summer Tour, France, Hiking, In France, In Italy, In Switzerland, Italy, Our Travel Journal, Switzerland and tagged Alpine, alps, Circular route, France, Hiking, Italy, mountains, Multi-day walking, nature, photography, sports, Switzerland, TMB, Tour du Mont Blanc, travel, vistas on Jul 23, 2018 by Aaron Hill.